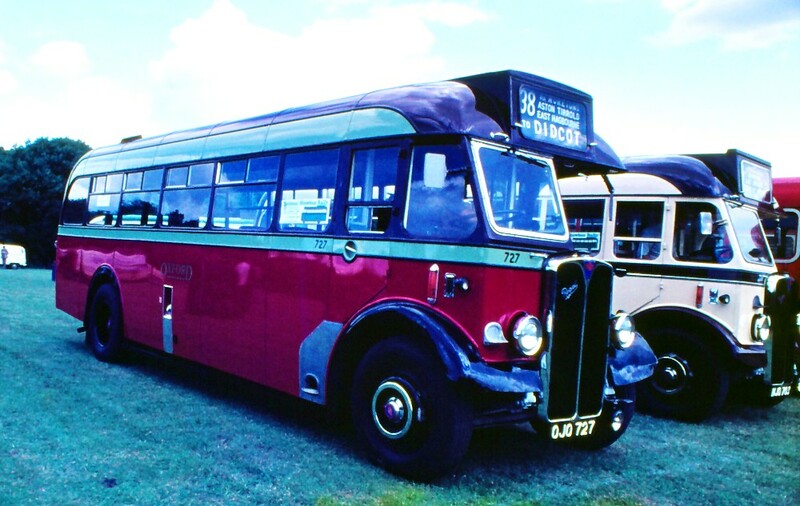 In this issue we have a number of pictures from the recent Showbus Event and some delightful pictures were received from Tony Bungay taken at the 1978 Showbus event which took place at Hillingdon 40 years ago. I include these below which may bring back some memories for older readers. I think you will find them self explanatory. 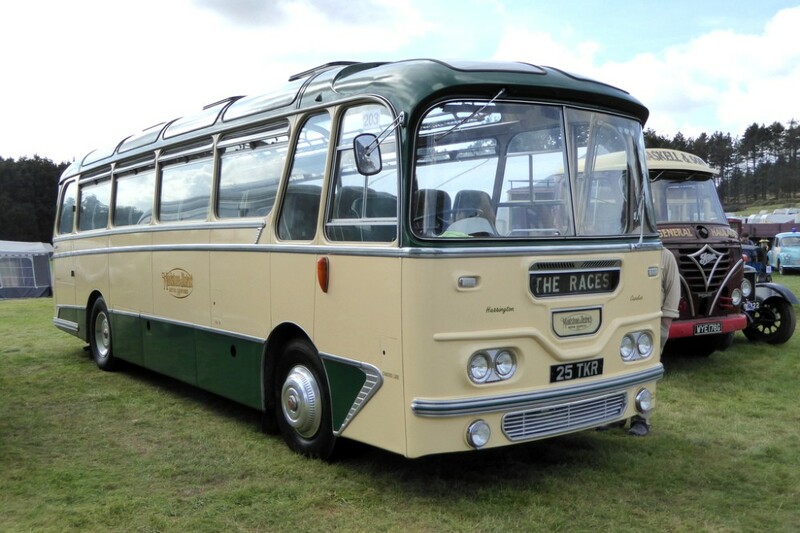 I am sure readers will appreciate the dramatic increase in preserved vehicles and now the attendance at events by new buses and coaches which goes to make a most interesting time we live in. 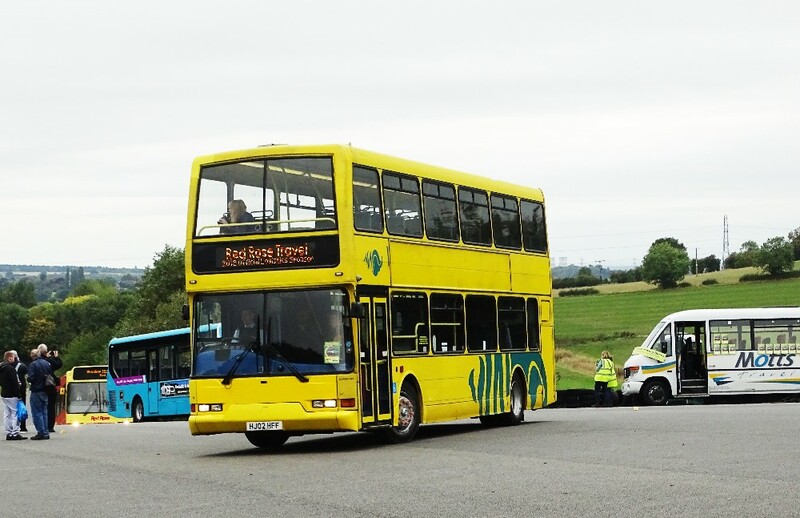 Below are some pictures from this year's Showbus event at Castle Donnington, this being the 47th event at one of the most popular rallies in the calendar. By clicking on the link below readers can find details of the vehicles attending which amounted to around 300. 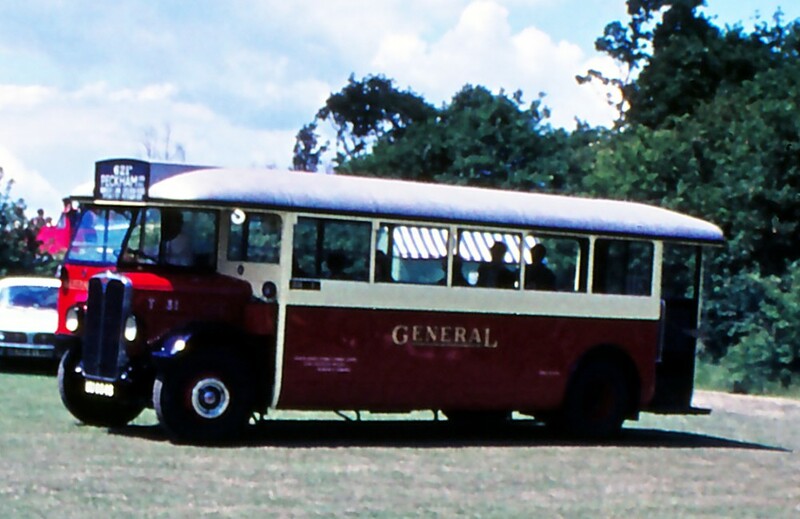 Andy Churchill provided some photos of attending buses and coaches. Andy's pictures showcased the Stagecoach contributions including the memorable Alexander PS type. I am very grateful to Gary Seamarks for a total record of all participants and I have tried to make a selection of vehicles of interest or from our area. 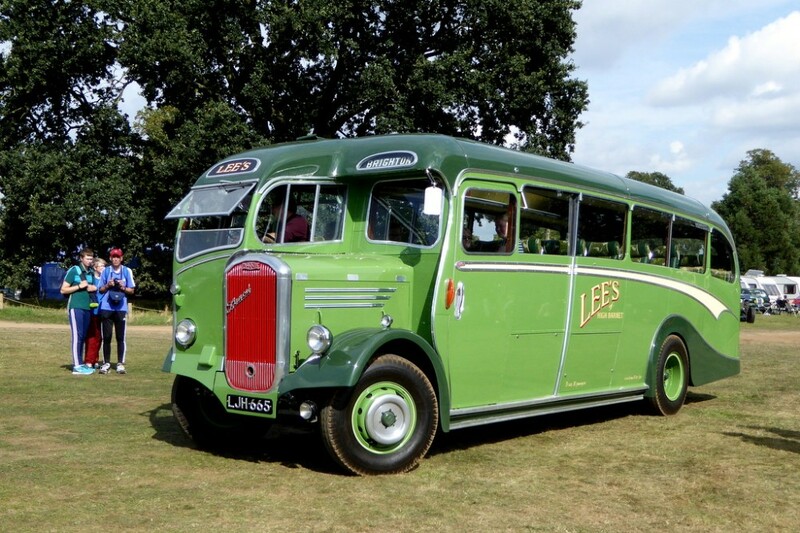 Full reference for the pictures can be found in the Showbus link above. 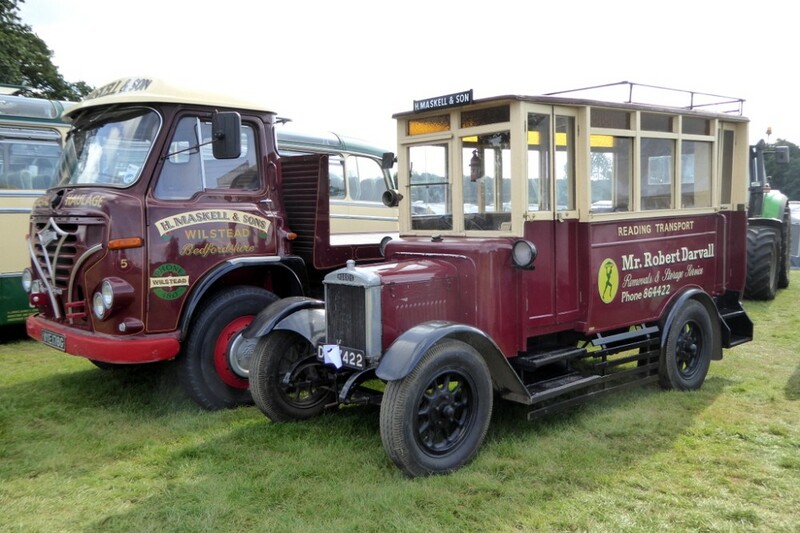 It is interesting that next year's event will be September 29th 2019 at Hertfordshire County Showground. This is at junction 9 on the M1. A date for your diary! Continuing in the theme of recent events. Neil Beckley wrote saying "I went to the Bedfordshire Steam Rally on Saturday, September 15th and attached are a few pictures I took at the event. The details are a bit sketchy on a couple of the vehicles, I got what I could from the programme and PSV Circle Preserved buses book. SLO24 1956 Commer Avenger TS3 in the colours of Post Office Cable and Wireless Services. DS 7422 1926 Morris Commercial 1 ton 12 seater in the colours of Reading Transport. 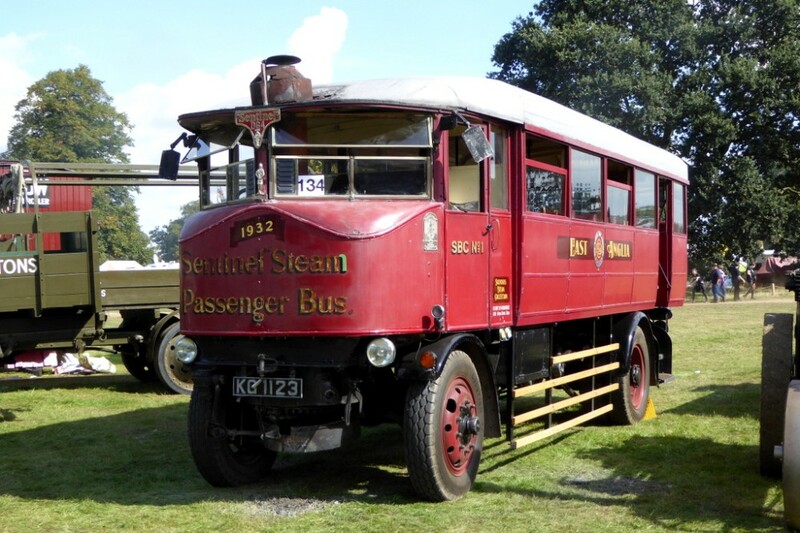 KG 1123 Bus body built in preservation on a 1932 Sentinel DG4P flatbed lorry. Many thanks to Neil for that contribution. 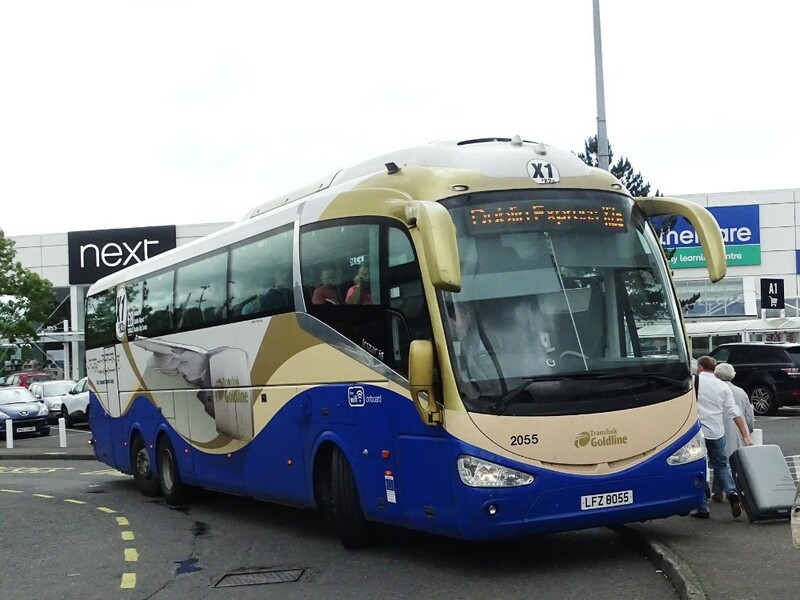 I think it is sometimes interesting to include places to visit with a glimpse into what one may see, Gary visited Belfast, on September 22nd, sending some pictures and saying "the ALX400 are Volvo's as are all other Translink deckers, the Solo and Primo, which was new with the registration MX07BBF to Southampton (Princess Line). are at Giants Causeway. Belfast is a very friendly city but not easy for bus photos, which was not helped by a massive Fire in the Primark store. The Gliders look like some-one has bin dipped the drawing office at Wrights, they seem busy but were also causing congestion." 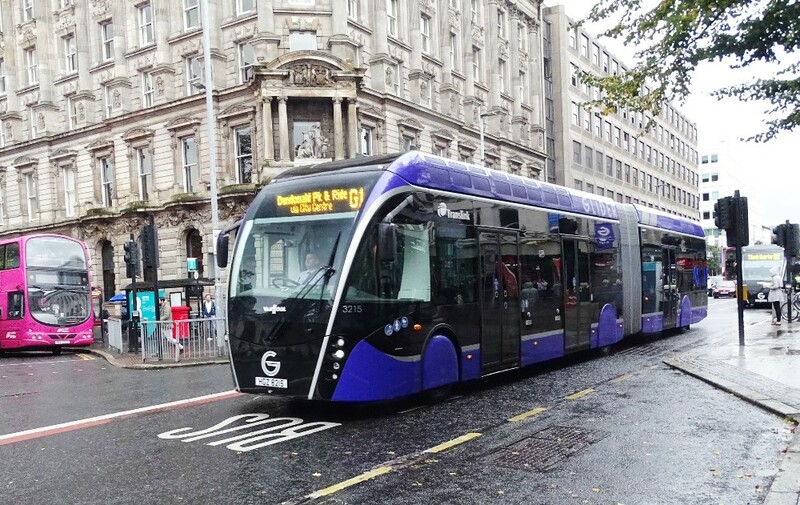 An aside to the Gliders was a report in a recent magazine that just three weeks into service one of the new Glider buses running in Belfast became stuck trying to turn a corner. 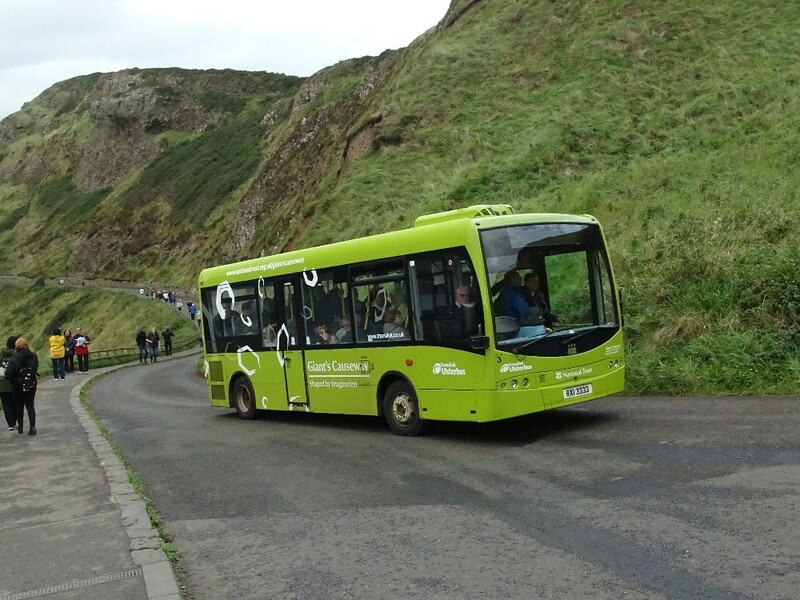 There were no passengers on board the 59ft (18m) long bus at the time! 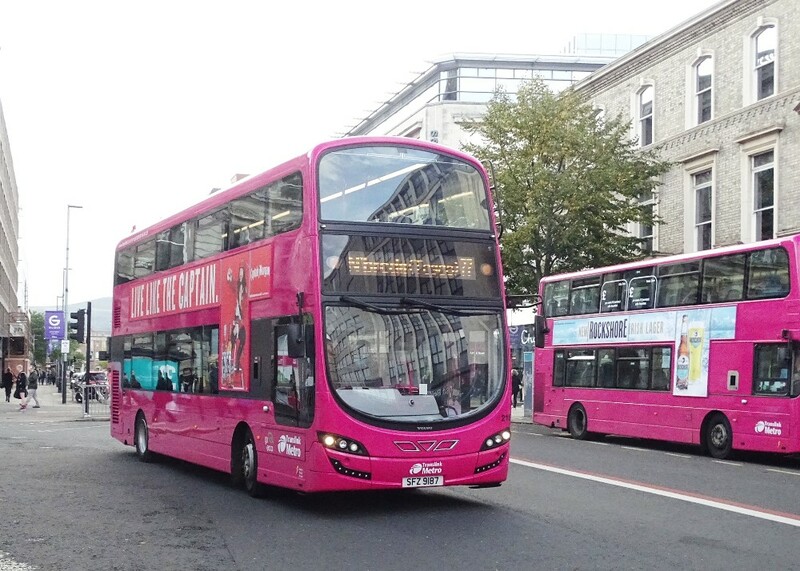 Two of the new Gliders in service in Belfast. The Belfast - Dublin service. 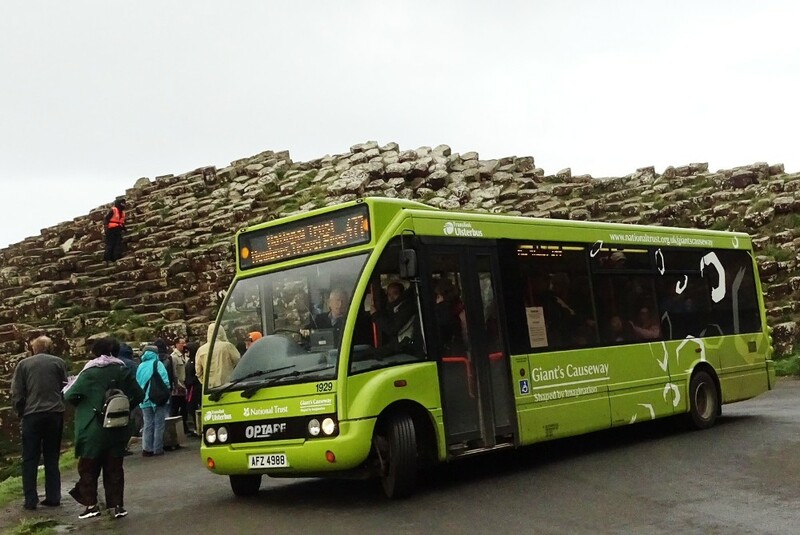 The Giant's Causeway service. This looks to be a well supported service. 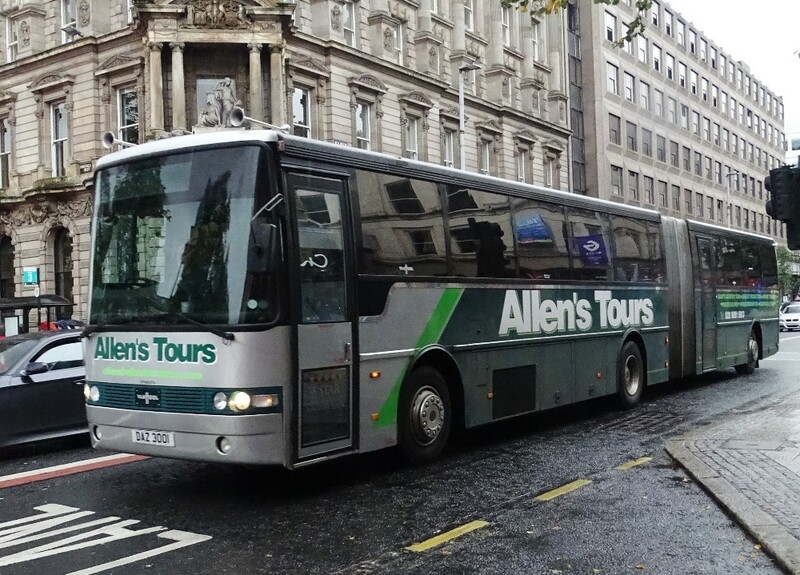 Allen's Tours DAZ3001 which was with Morton's in the UK where it was registered H15BUS but was originally new to Translink. Sightseeing in Belfast. 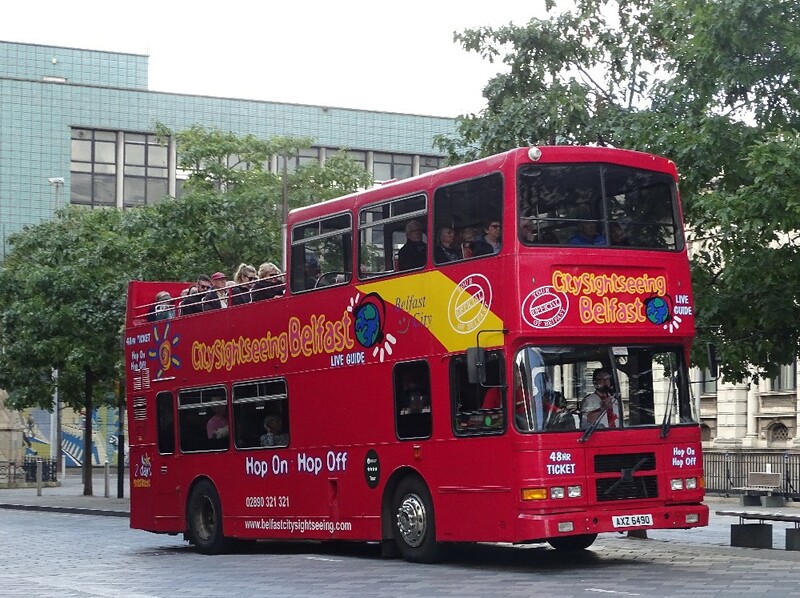 The City Sightseeing one is ex Dublin. A visit I made to Belfast with Chris Maxfield several years also proved very interesting. 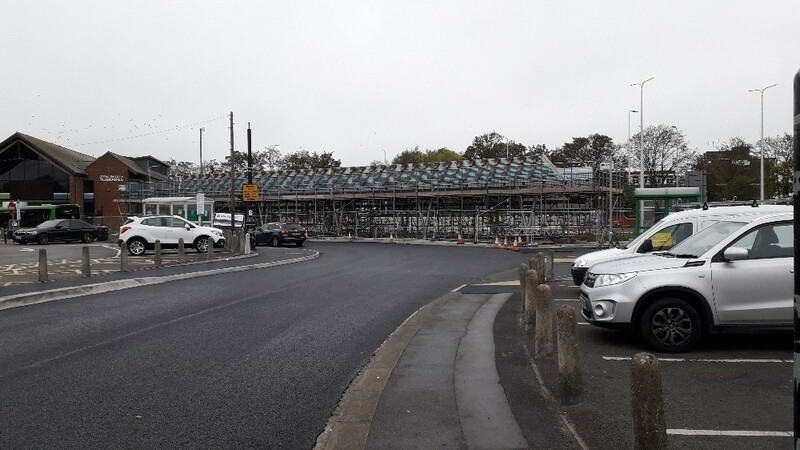 Dylan writes to say "With some big developments in my area, I thought it was time to share some recent photos. 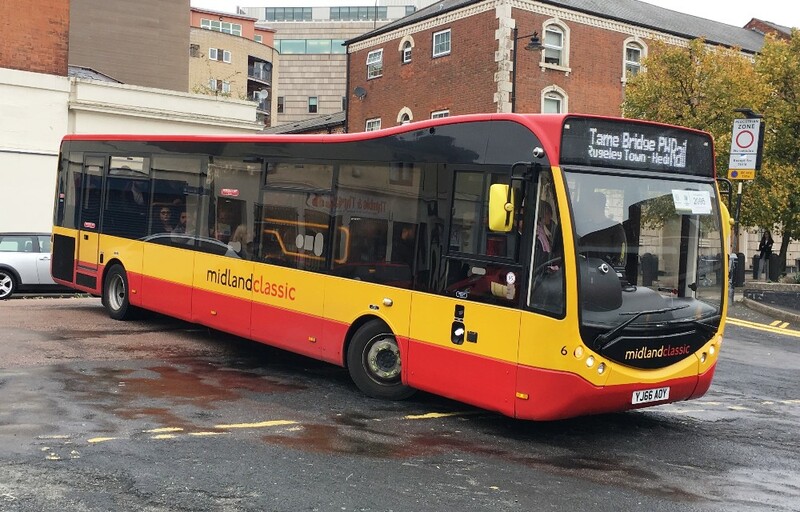 Firstly, the big news is the introduction of the West Midland Bus brand, which fits in with West Midlands Railway and the Metro system, each using their own colour scheme. 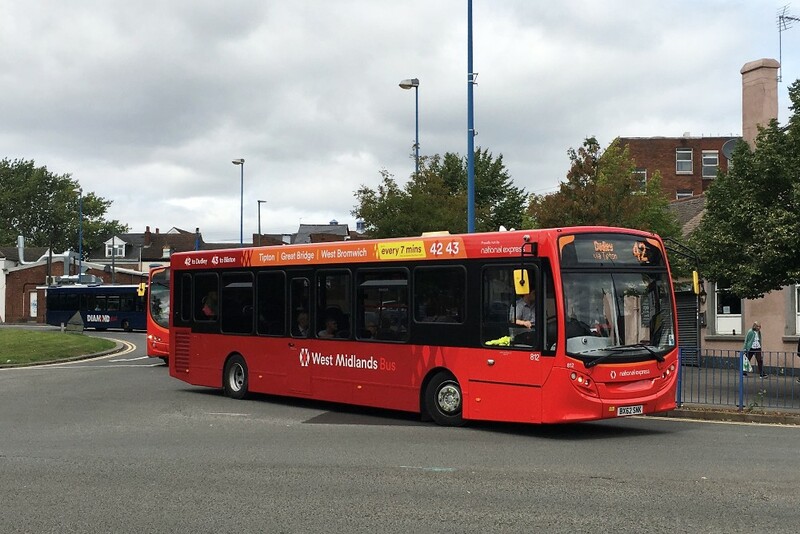 Routes 42/43 in West Bromwich and 31/32 in Walsall have/are receiving Buses in the new colours - these were previously routes that Rotala Diamond competed with National Express on so one of the main aims is for an even timetable in which passengers can board any bus with any ticket. 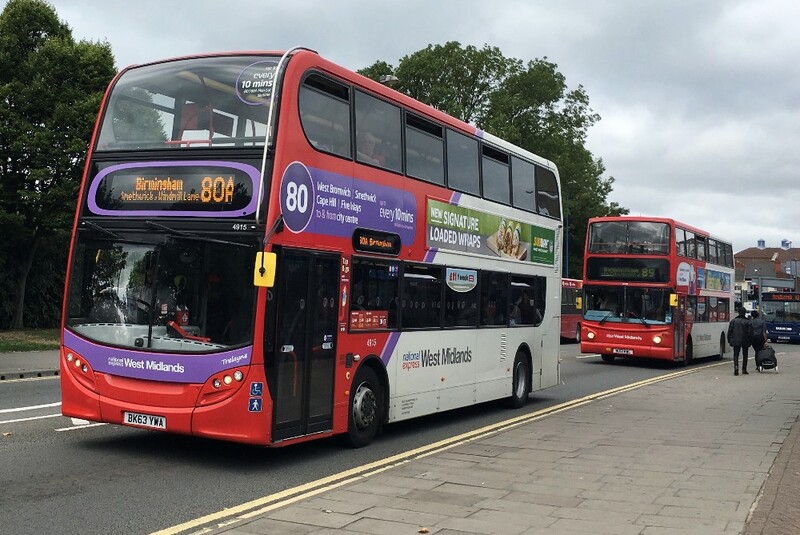 Route 42/43 has been route branded and 31/32 may have some finished by the time you are reading this"
807 contrasting with 814 at West Bromwich on August 22nd. 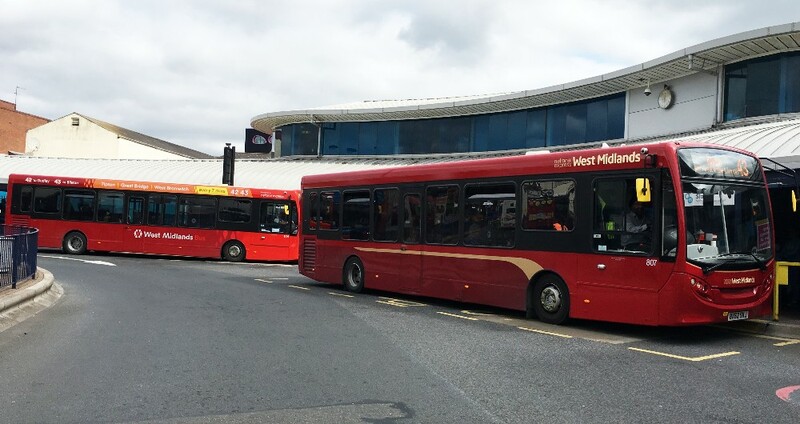 Repaints of the 8xx series Enviro 200s based at this depot has paused, presumably because further buses will be needed in the new WMB livery as more routes are rolled out. 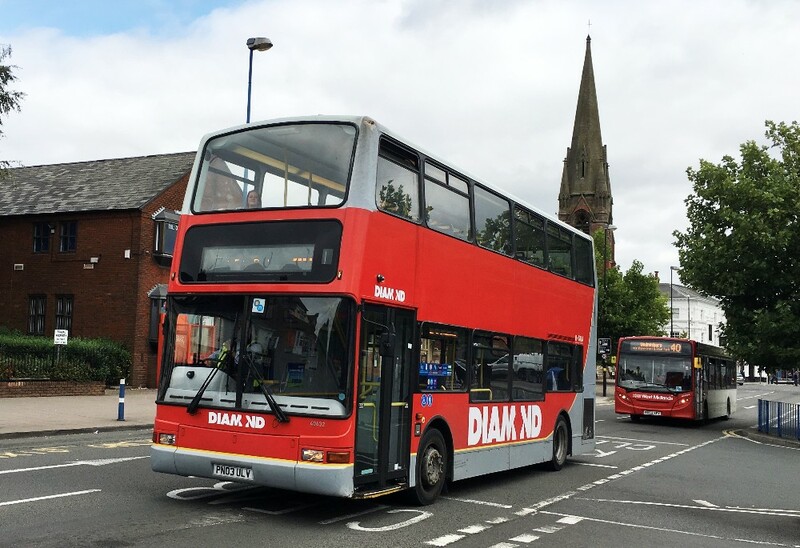 The other main change is the Dudley Route Changes that have took place, eliminating the former Midland Red 2xx number series leaving Birmingham as the only area still with original, pre West Midlands Travel/PTE route numbers still in place. I didn’t do as much photographing of the routes for these changes as the South Birmingham ones but still have a fair few to hand. First up, routes 222 and 223 on show at Dudley. 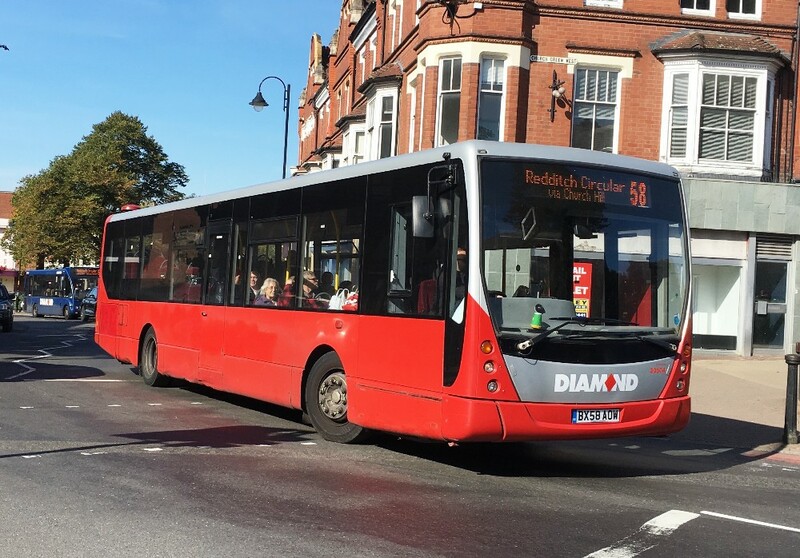 NXWMs 868 was new to Pensnett in 2015 as part of the last red and white single deckers, seeing use on various routes around Dudley. 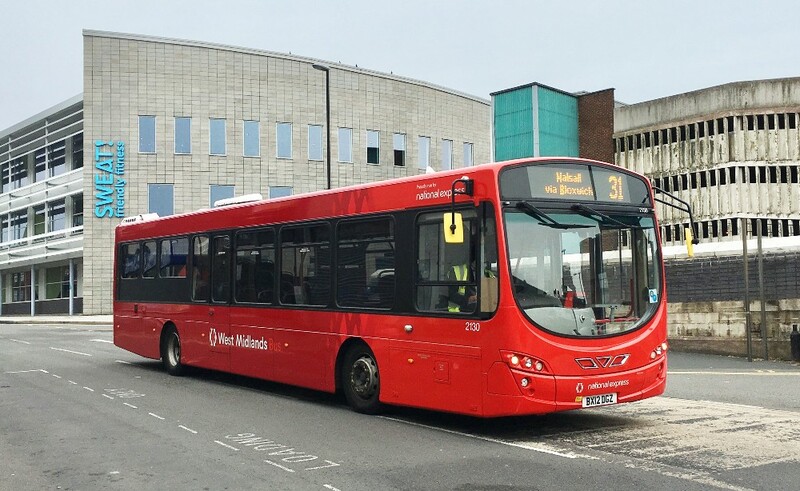 The 222 is the main Merry Hill to Dudley Route and runs Every 15 minutes, formerly having branded E200s, new in 2012/2013 for the route. It has since became the 2/A. The 223 is still the same and was using former Hanson’s 2571 - now 20531. As you mentioned on the recent High Wycombe part of your post, the low sun is certainly going to aggravate me this winter after all the good shots I have got this summer but I will try my best, as from last winter, I remember that in open land it is just about possible for full sun photographs. 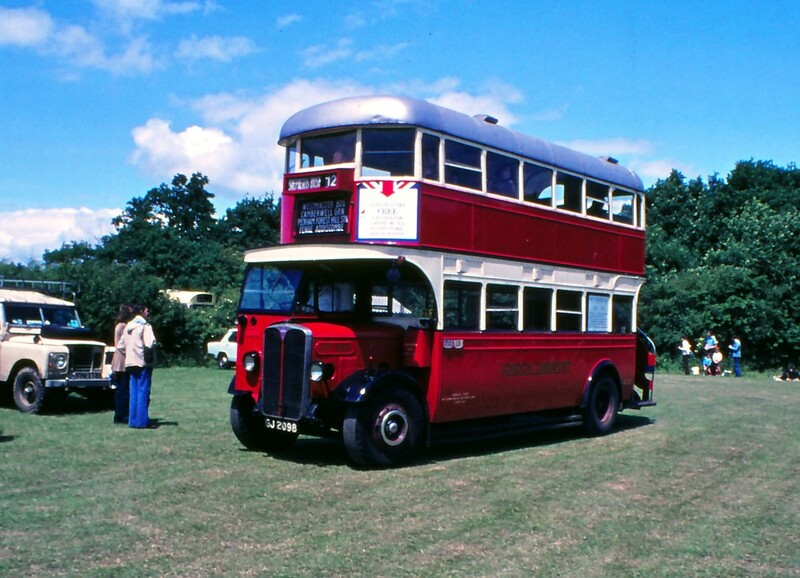 Firstly, 4 Bristol Road Service 61/63s are captured at Northfield as they head for Frankley. Very unusual for a Sunday! 4938/5501/5517/5514. 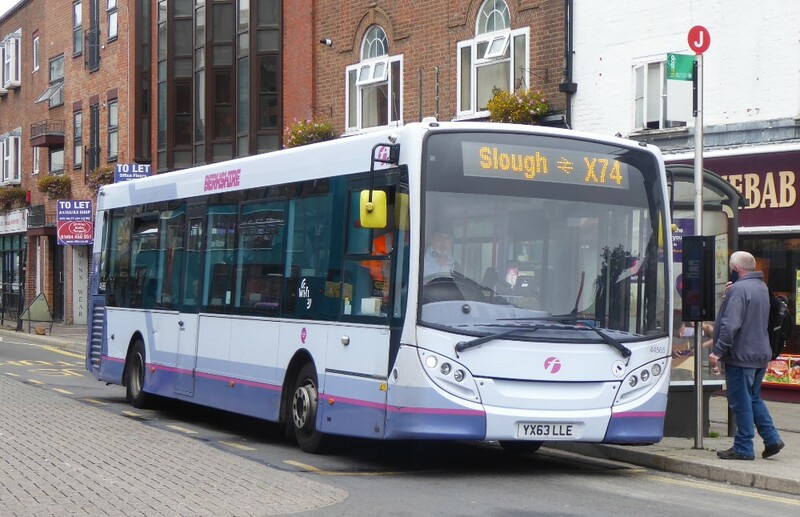 The main reason for a trip to Redditch was to view the recent transfers from Wessex. 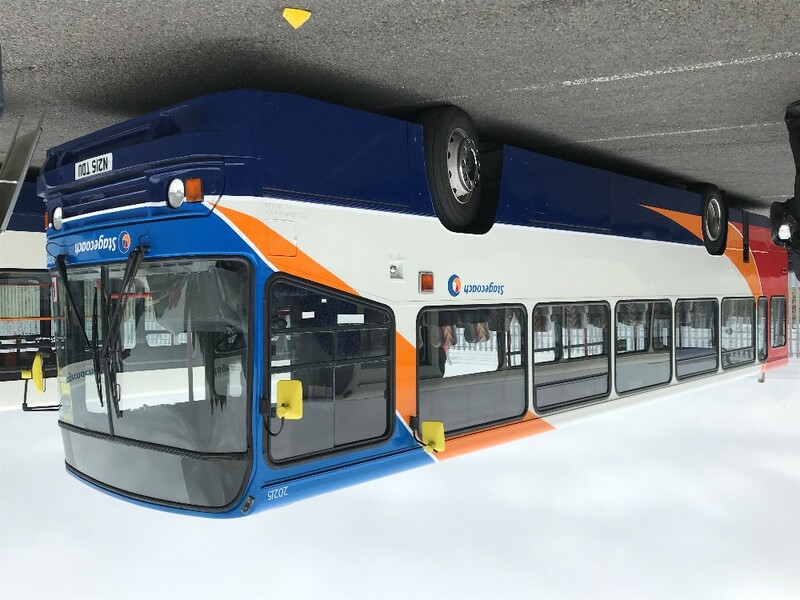 30501/3/4/7/30812 have all joined the fleet and are welcome additions that seem to have ousted unreliable StreetLites and VDL chassis Plaxton Centro's. 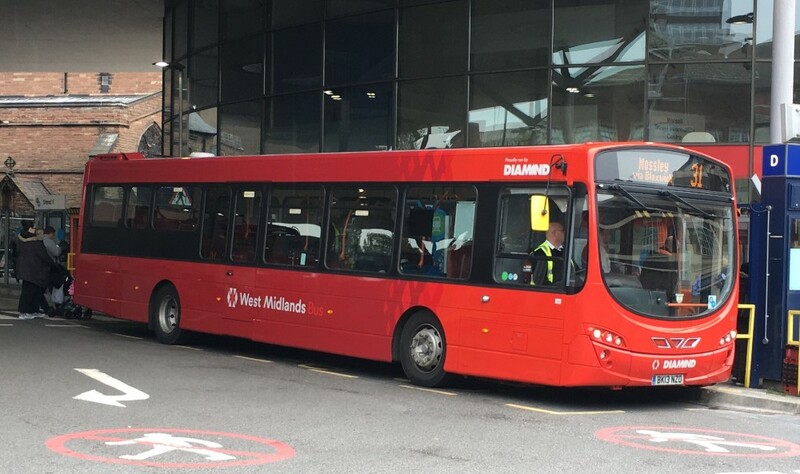 Here is 30812 departing with a 70 to Astwood Bank - I understand this bus was new to Diamond West Midlands, carrying the now obsolete Black Diamond livery. 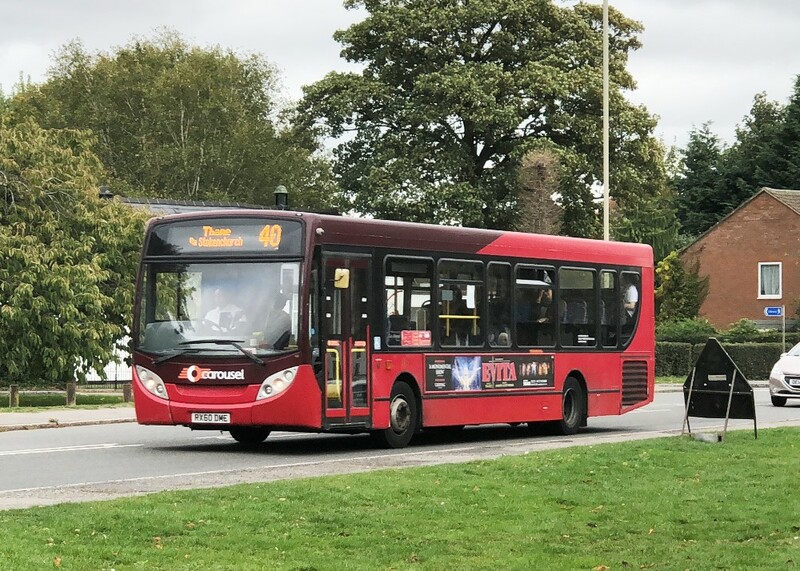 Another one of the Centro's - 30504 heading out of the town with a 58 Redditch Circular via Church Hill and Matchborough. This one notably only has front logos applied. 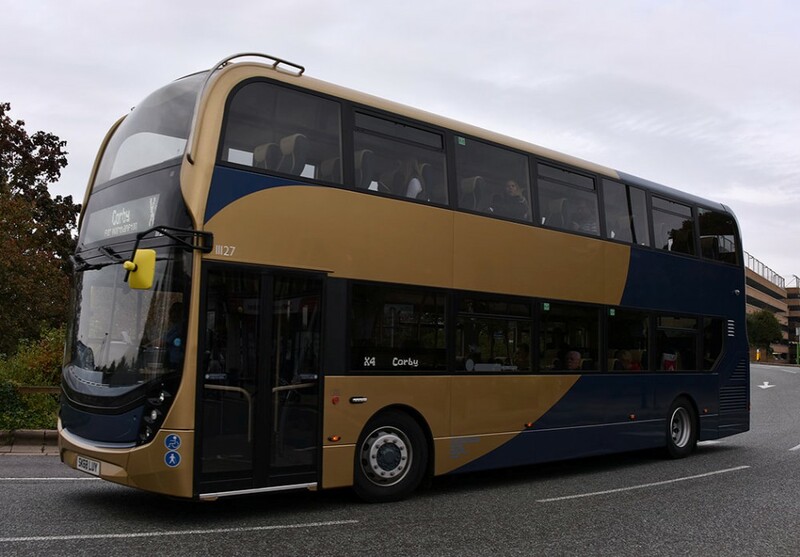 The only Wright bodied Volvo B7RLE now based in the town is the special Monopoly themed bus, 30857, which spends most of its time on the 57/58 circulars. 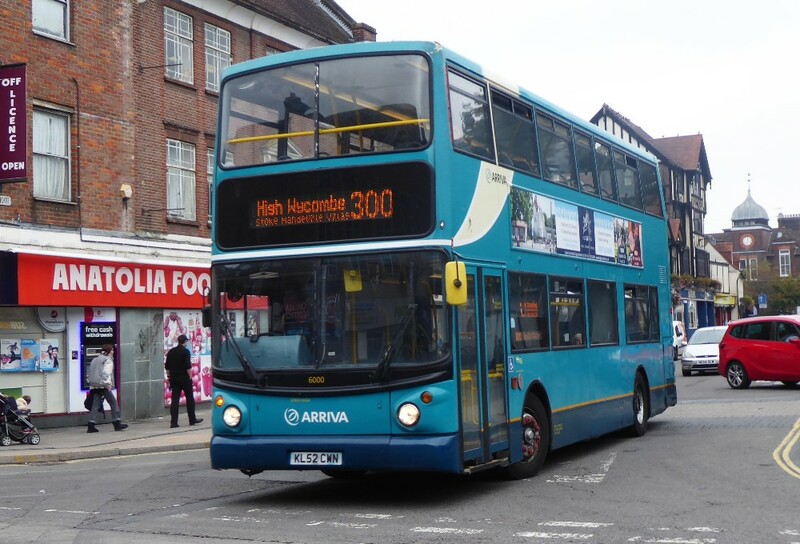 The whole of 30850-61 were new to Redditch but this was the only one to stay, obviously due to the special livery. Whilst in Walsall last weekend, Rail Replacements were running for West Midlands Railway so I hung around for half an hour to see what was around Here is number 146, one of three Optare Metrocitys in the D&G Bus fleet of Stoke-on-Trent, arriving with a Rail Replacement to Tame Bridge Parkway. 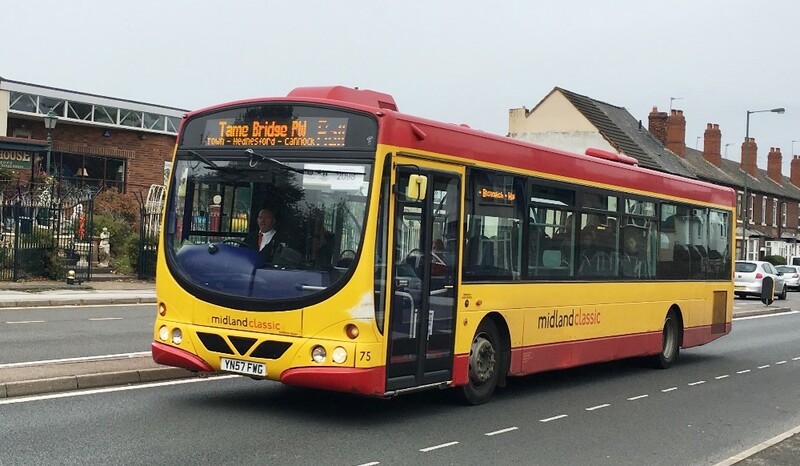 Joining the D&G example was one of 6 operated by Midland Classic (No 4-9) Here it arrives with a Rail Replacement from Rugeley to Tame Bridge. Currently NXWM only have 812/814 in the livery but 811/813 should be coming out of paint soon. 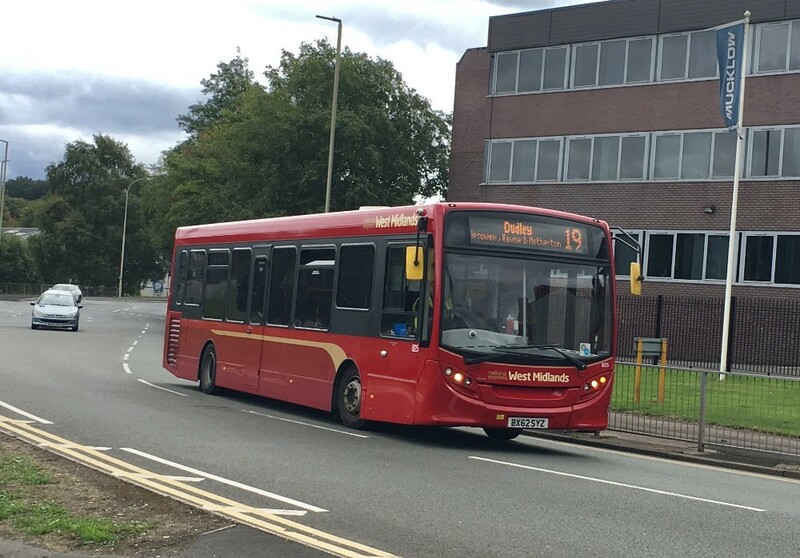 812 is pictured arriving into West Bromwich on a 42 to Dudley. A slight oddity in the fleet is this Scania K230UB chassis Wright Solar, the Rest being on older L94UB chassis. 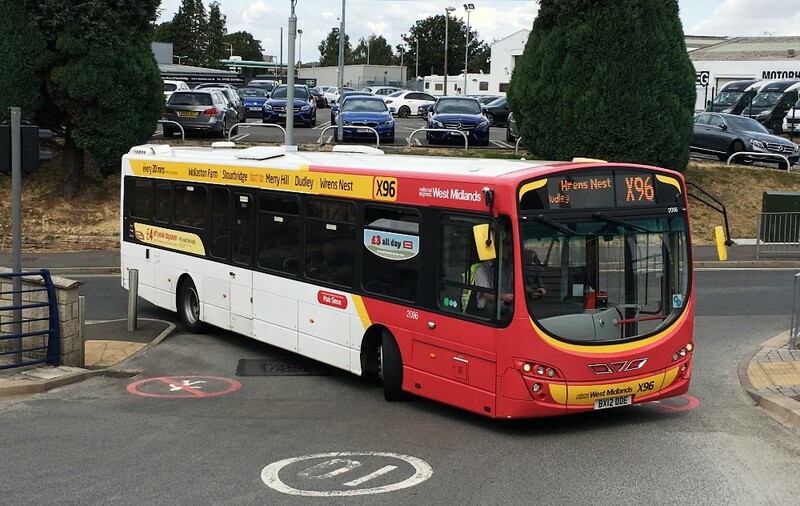 Formerly with Reading Buses, 75 passes the entrance to the National Express depot at Walsall, with a Tame Bridge bound Replacement. NXWM 4229 works the 48 to Northfield. A pair of NXWMs large batch, of the fairly rare Scania Omnilink Type, heading opposite ways on the 4 route between Walsall and Halesowen/Merry Hill. 1853 and 1861. 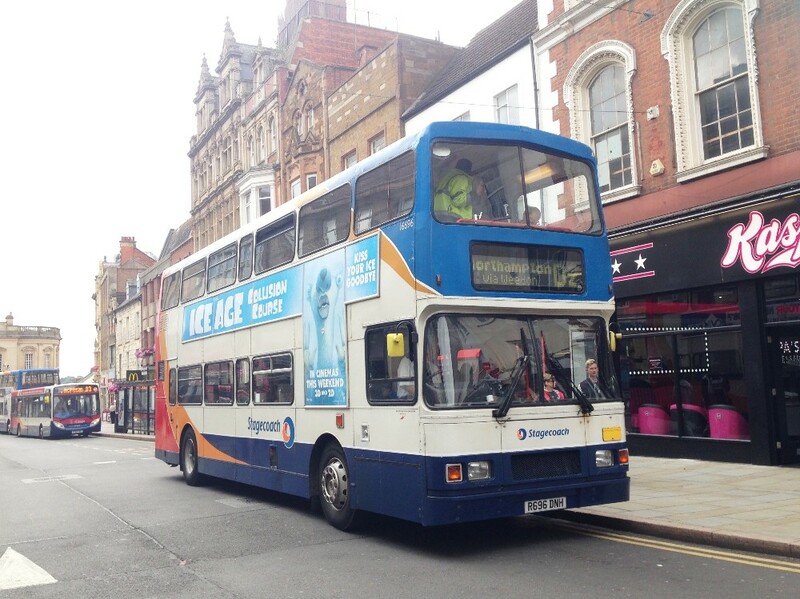 Here is an old shot of 16696 in Northampton with a D2 service. It was participating in a small farewell event for the type. 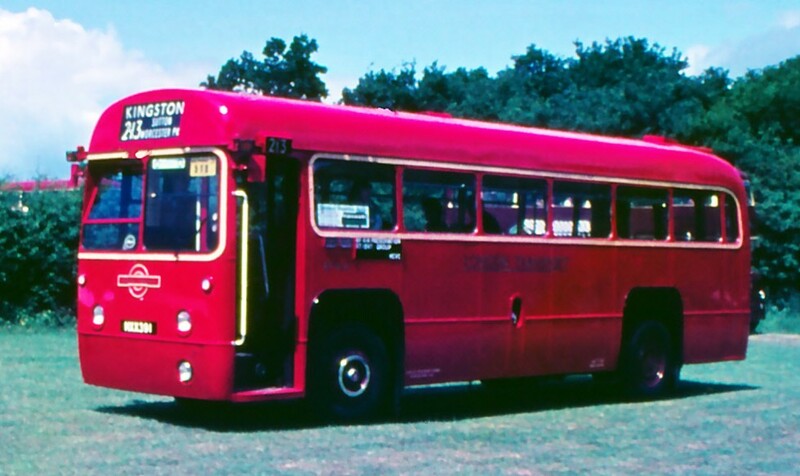 Diamond 40632, one of 3 Trident Presidents that were new to London General, acquired with the business of Central Buses. Noted arriving at West Bromwich. 4915 on the 80A to Birmingham as it arrives at the Bus Station. And a selection from Walsall, a month later on September 22nd. 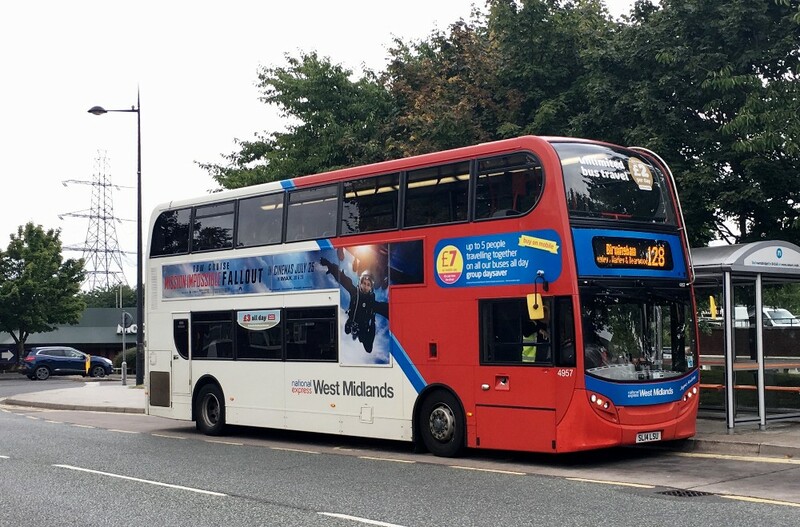 NXWM 2130, one of three currently carrying the base West Midlands Bus livery for the 31/32 routes. 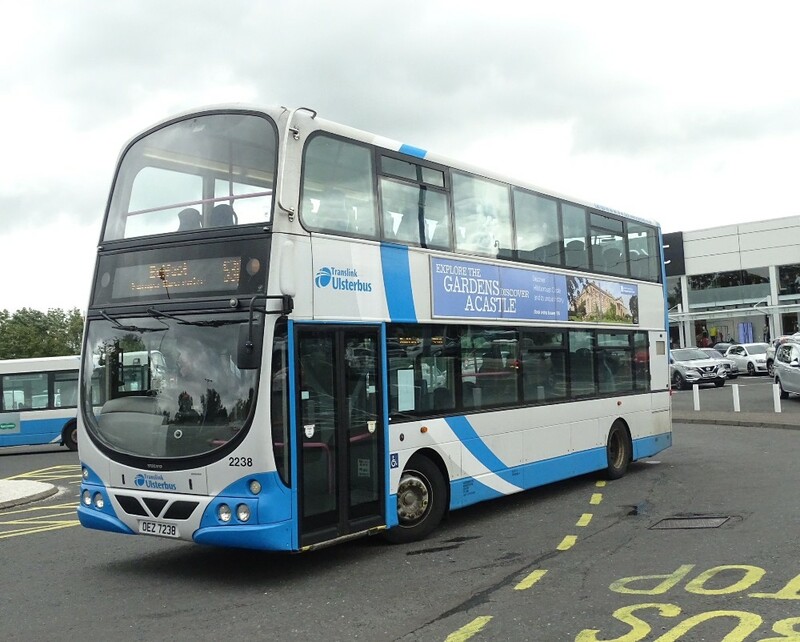 This was formerly at Birmingham Central where it was used on now ceased routes 29, 58, 59, 98 and X64. Only a handful are left to operate the X21. My photo of this bus in the bus station after I got off wasn’t the best so this one has to do. 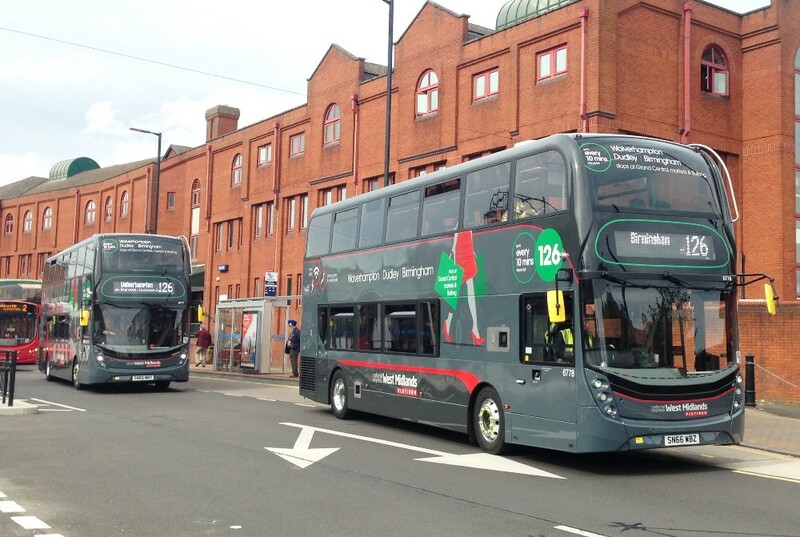 2118 departs Walsall with West Midlands Bus branding for Lower Farm on the 32. 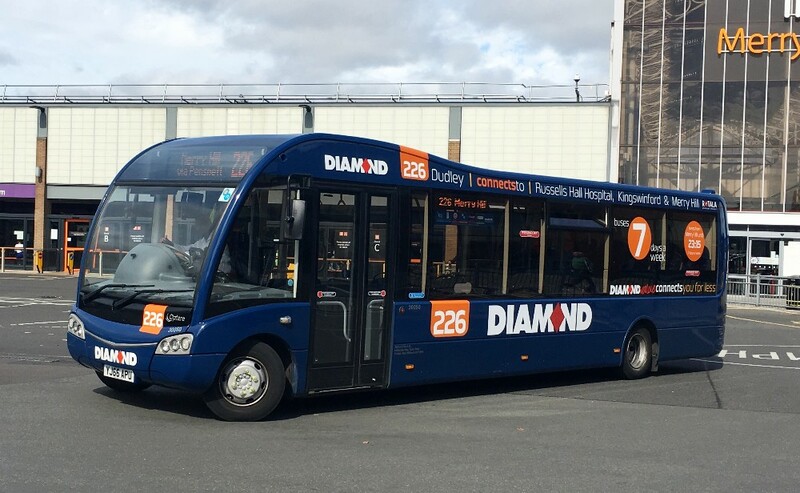 And Diamond are using buses of the same type on the 31/32. 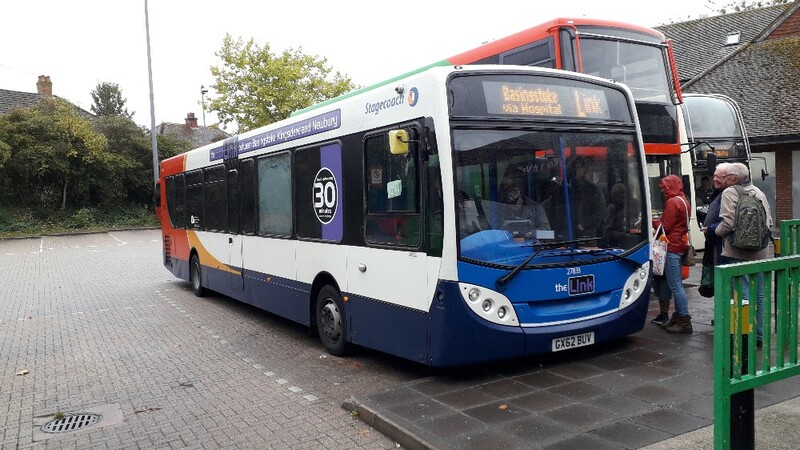 30938 was new to Wessex, transferring to Diamond at Kidderminster in 2016 for use on competing route 25 between Stourbridge and Kidderminster, against Central Buses 125. When Rotala acquired Central, it was debranded and remained at the depot for a few months before transferring to Tividale, still in blue livery. 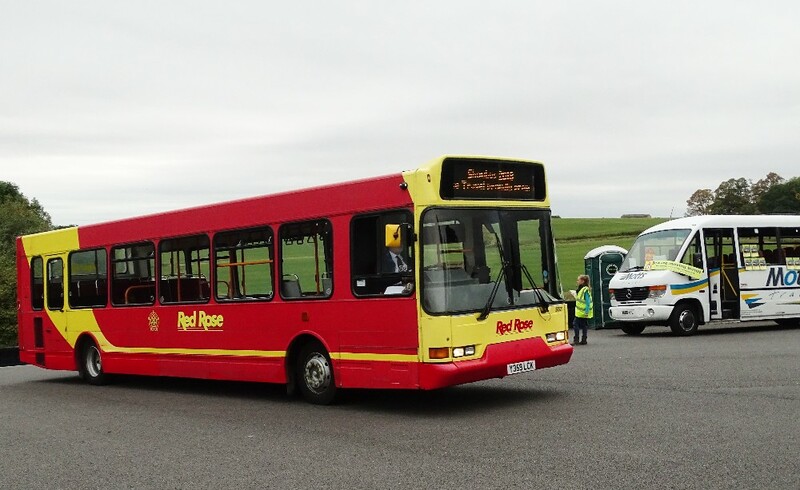 When pictured it was spotless, having been in service just a few days in the new livery. Also sampled at Walsall was the heritage liveried 4601. 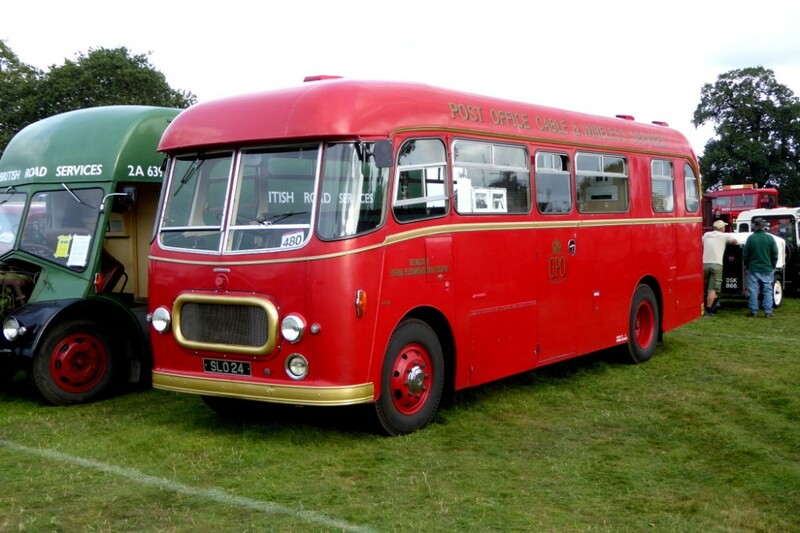 It is the second of what is to become at least 4 heritage livery buses (the others being Coventry and Wolverhampton plus another). 4601 and the yet to be unveiled Wolverhampton one are due to attend Showbus this year. 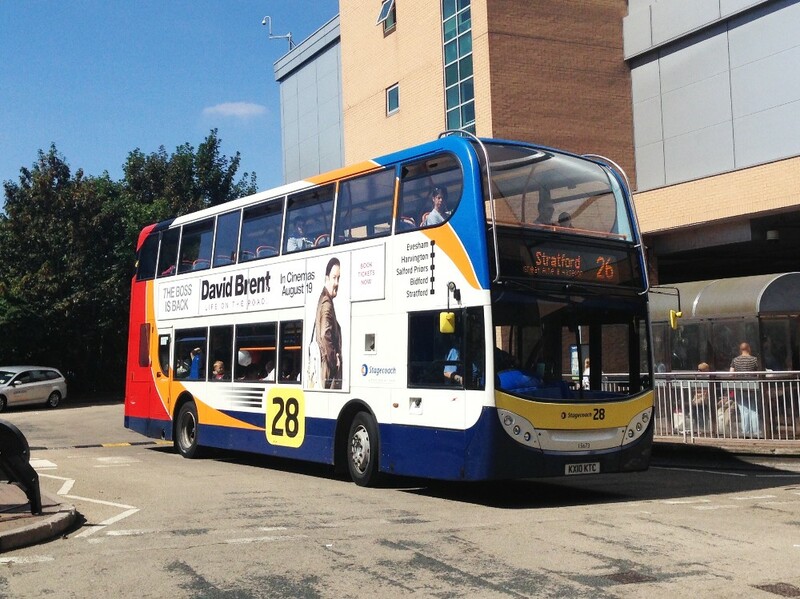 It is pictured departing Walsall Bus Station on WMB route 32. 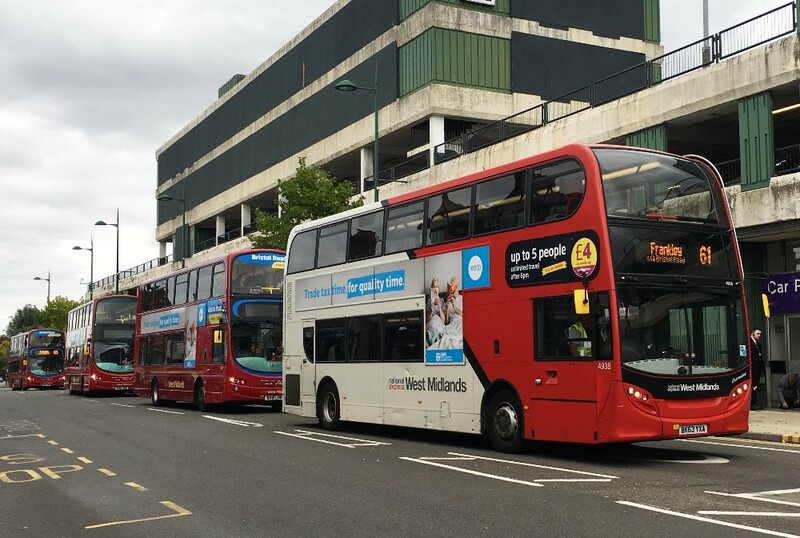 Three West Midlands buses are included in the Showbus report above. Ed. And finally, quite a contrast against 4601 is scruffy 4155. Now showing its 17 years of age it too was on the 32 to Lower Farm. 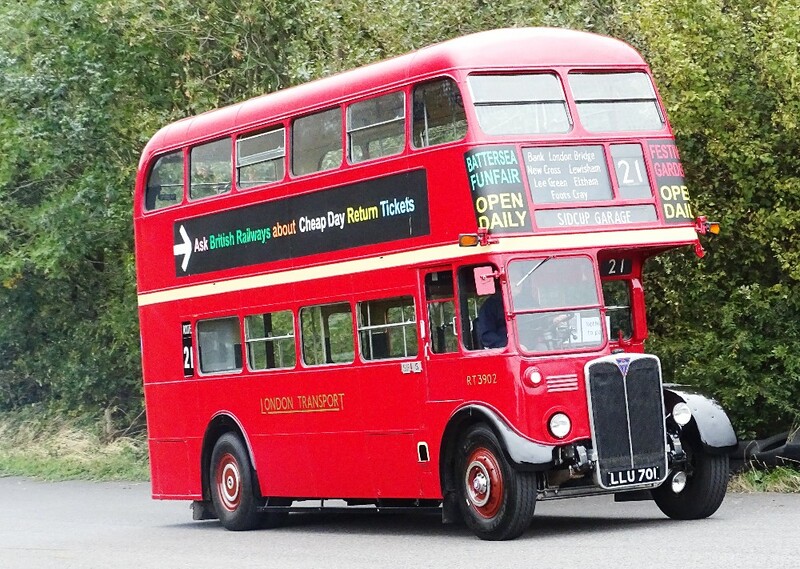 One route which has survived under its old number is the 226. 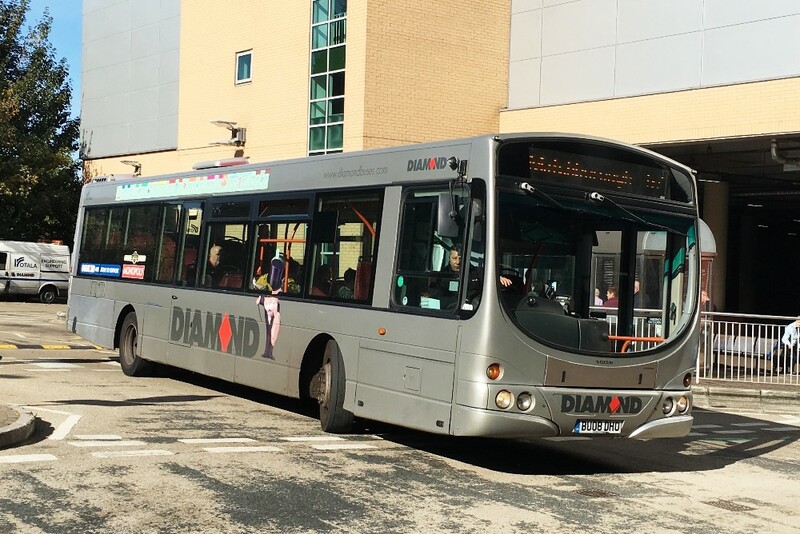 Operated by Diamond they have recently introduced some modern Optare Solo SRs that were purchased from now ceased Express Motors. 30050 is seen having unloaded, about to have a break. 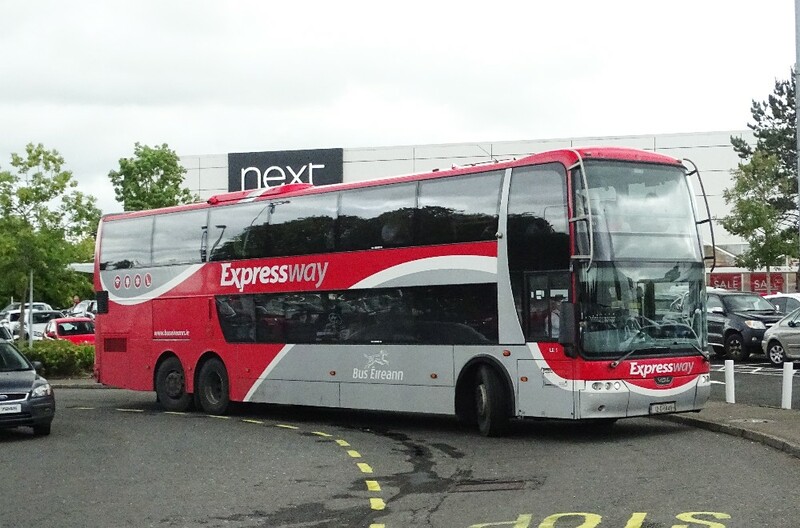 The X96 was never really an express service under NXWM but originated from a very long Midland Red Service Running from Shrewsbury to Leicester I believe. 2096 now has been debranded and the route has been renumbered 8. Pictured at Stourbridge. When in the Royal air force at Bridgnorth I remember going into Birmingham on an X96 operated by Midland Red. Ed. 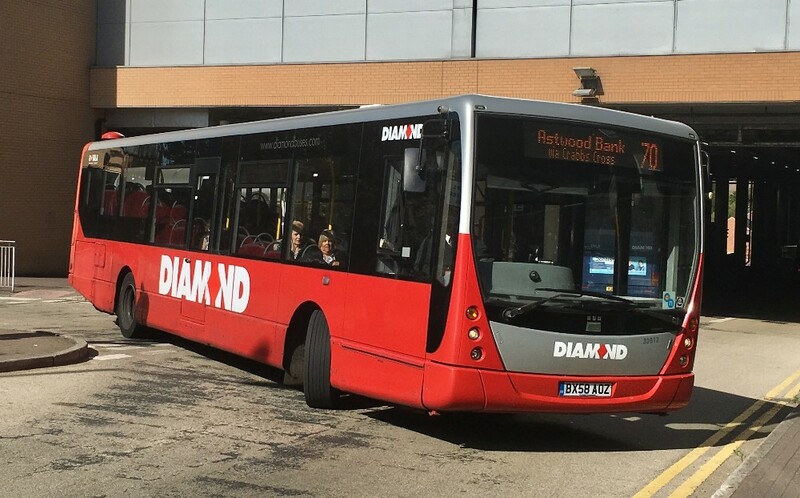 The 126 now operates just between Birmingham and Dudley and has lost the Platinum status. 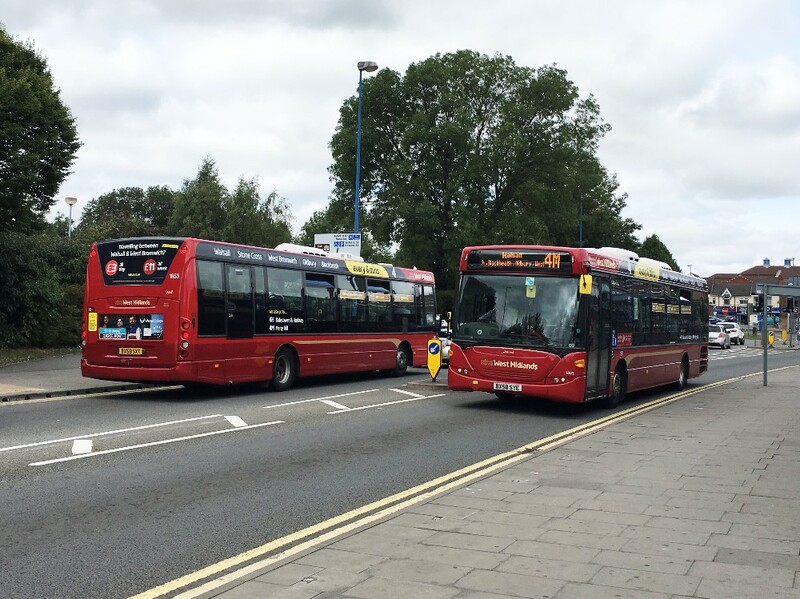 New routes X7 and X8 are using buses like 6778 as seen in Wolverhampton with another behind, when new into service. 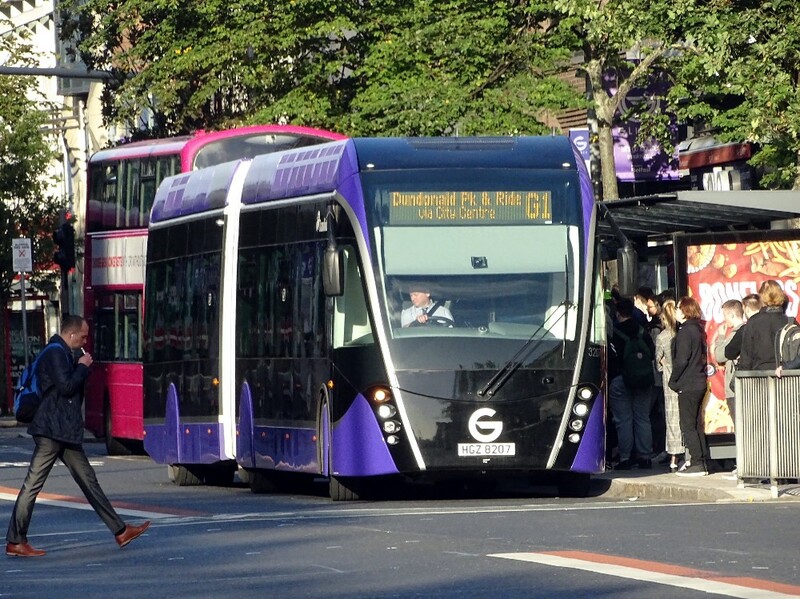 Purple branding is now being added to the former 126 batch but they operate via totally different routes than before. 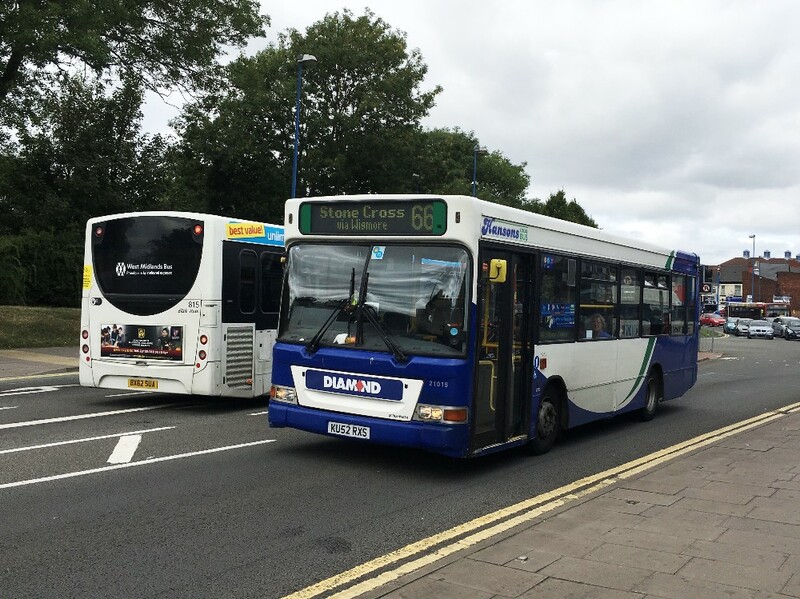 New route 19 has replaced the former 244 between QE Hospital and Dudley. 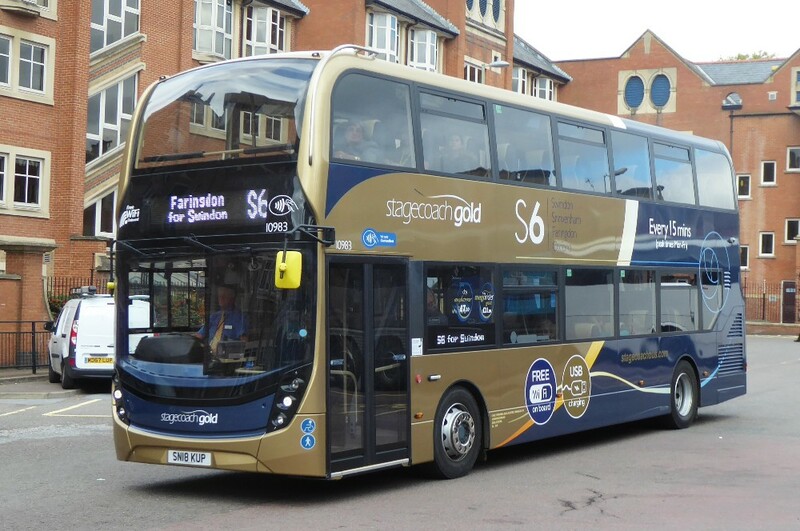 825 is seen on the outskirts of Halesowen heading for Dudley, carrying the new livery. 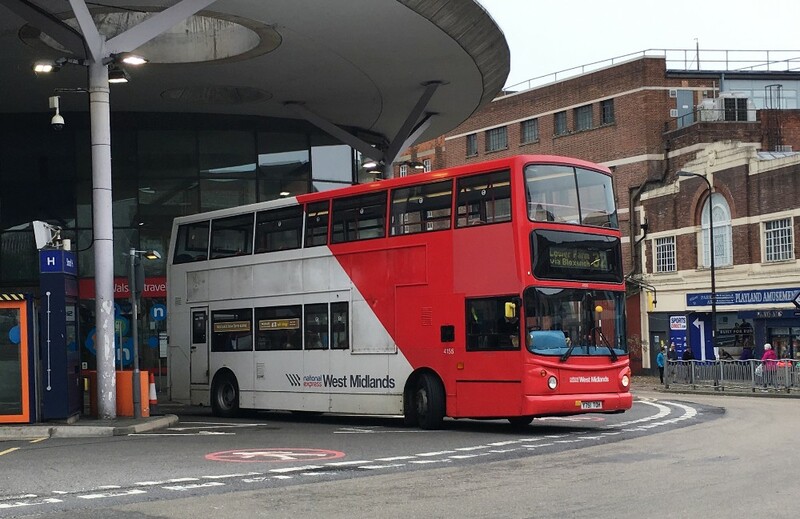 Before the West Midlands Bus livery was introduced onto the 31/32, it was numbered 301/302 and used these branded Volvo B7RLEs. 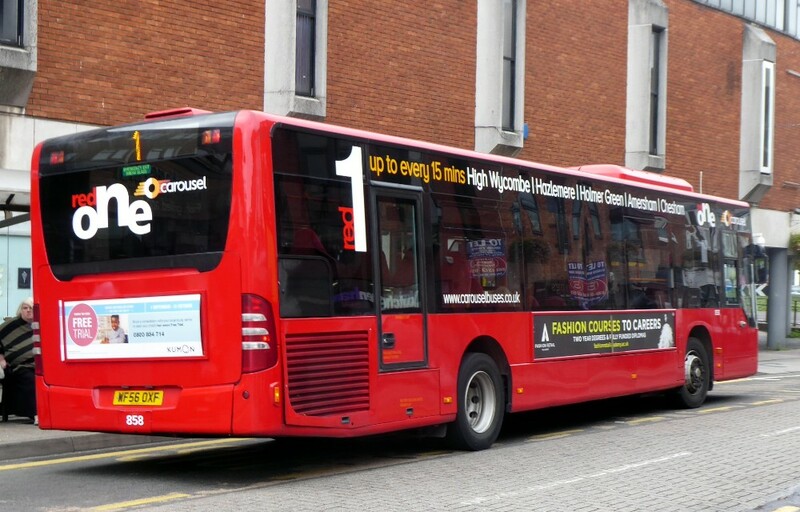 Route 13 was withdrawn as part of the changes, becoming the 11A so number 13 could be used elsewhere. Just a few days later it was debranded and these are now regulars on the 11/A. 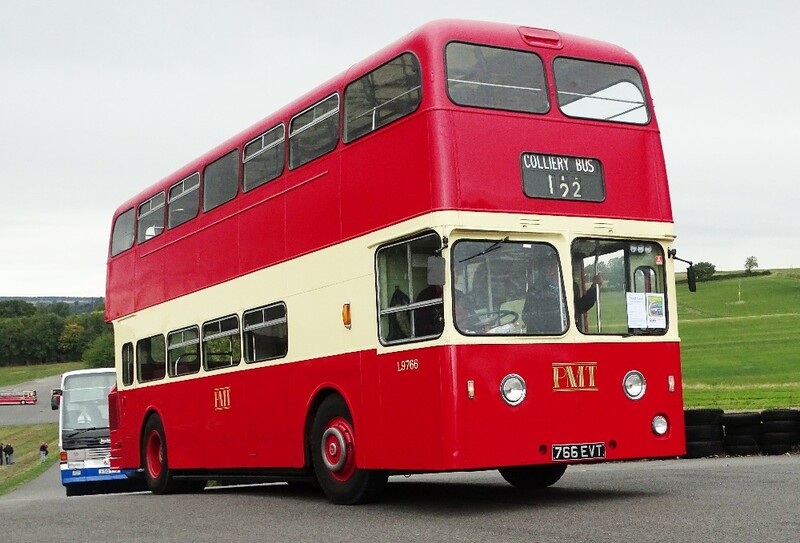 128 is another former Midland Red number. 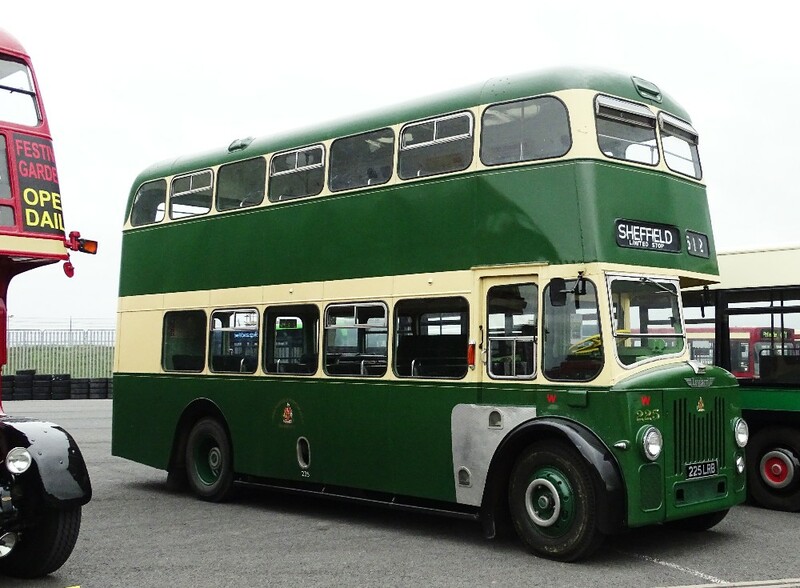 4957 was pictured at Oldbury Interchange when awaiting its return to Birmingham. This is the route that took the 13 number. 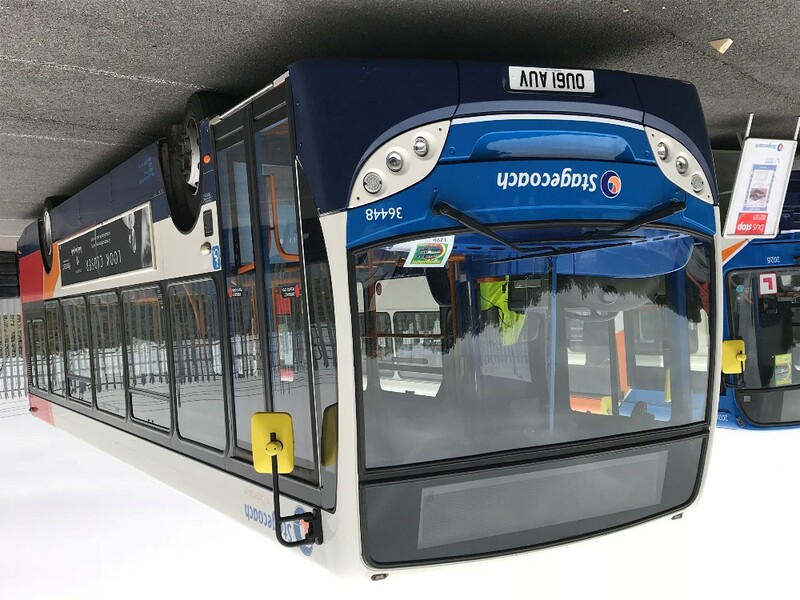 5 StreetDecks are based at Pensnett depot, mainly seeing use on the 6, 9 and X10 routes. 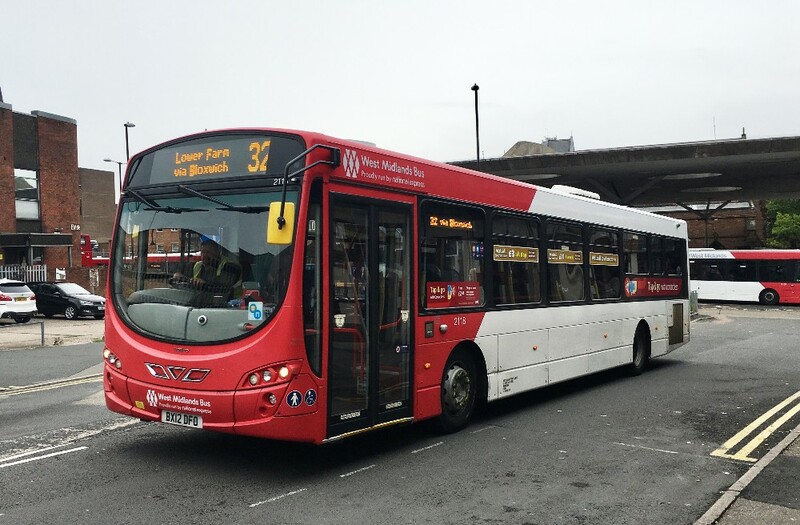 3301 was the initial one in early 2016, with four more following in late 2016. 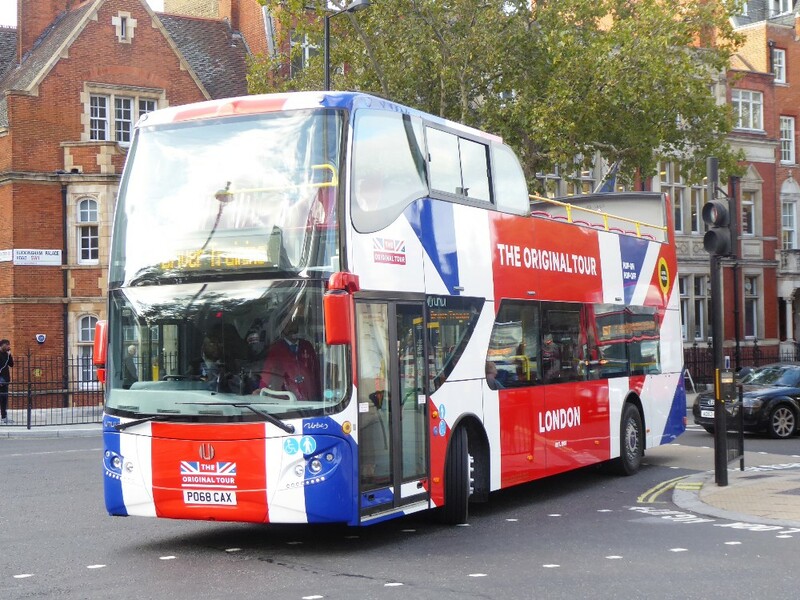 The livery blends onto the design rather well but these aren’t as powerful on the many hills that the 9 has to offer. 3304 arrives at Stourbridge on the 9 from Birmingham. Many thanks to Dylan for a most informative report which may prove useful for anyone visiting the area or even encourage a visit in the approaching Autumn days! A few photos from the past week taken in high Wycombe by Gavin Francis. 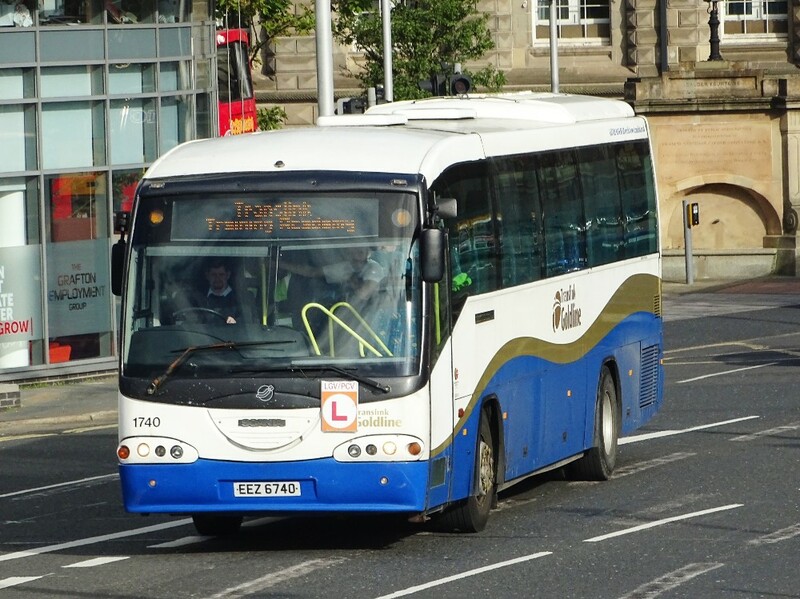 Citaro 3012 with the 34 on October 5th. 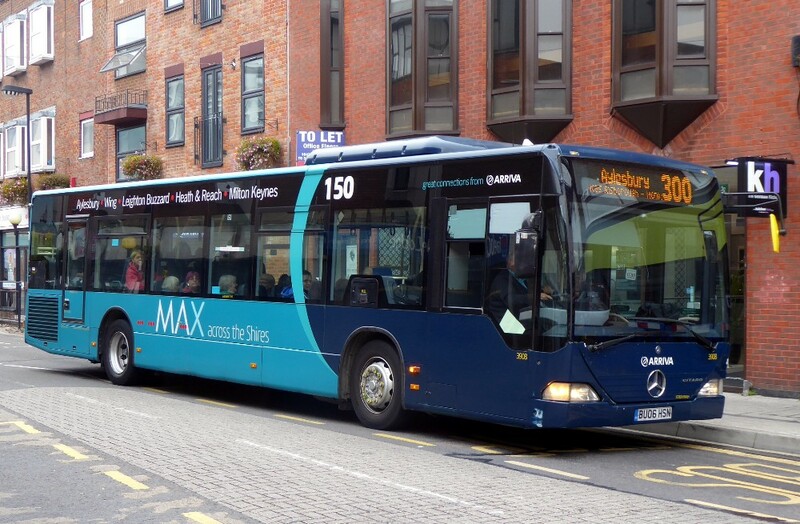 Citaro 3908 with the 300 but branded for the 150 on October 5th. 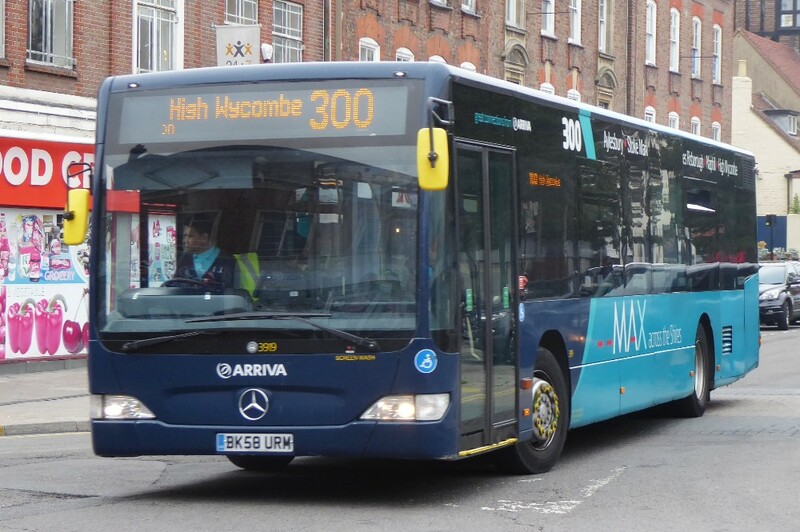 High Wycombe based 3919 actually working the 300 on October 5th. 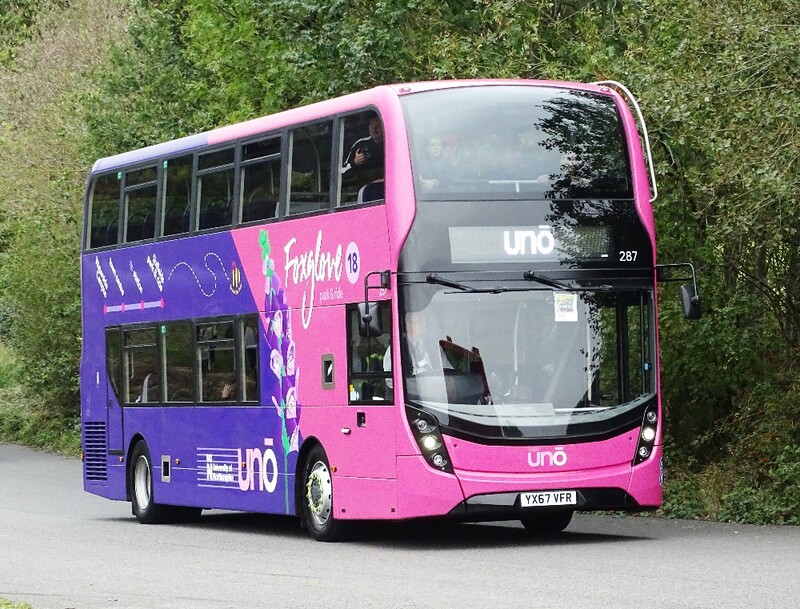 However High Wycombe based 6000, unbranded is also working the 300 on October 5th. Nick Ross sent an interesting picture with comments from Leighton Buzzard. 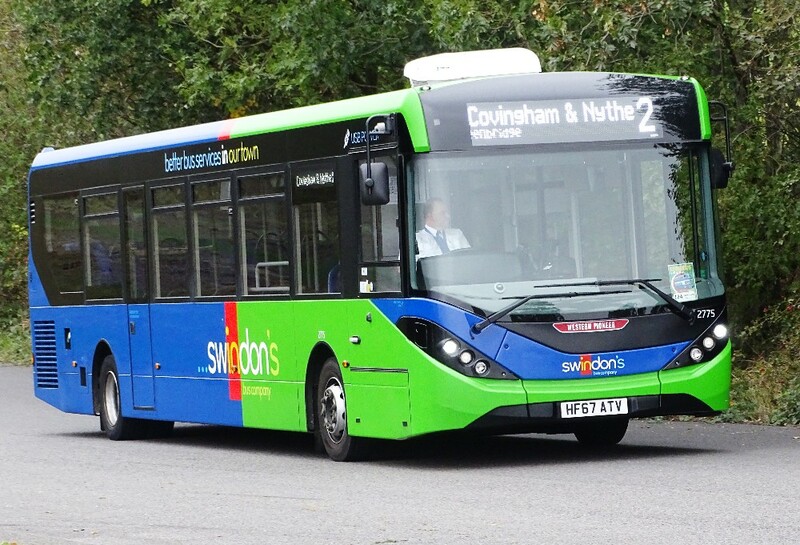 Minibus 1007 in use on Leighton Buzzards local service on September 28th by Nick Ross. 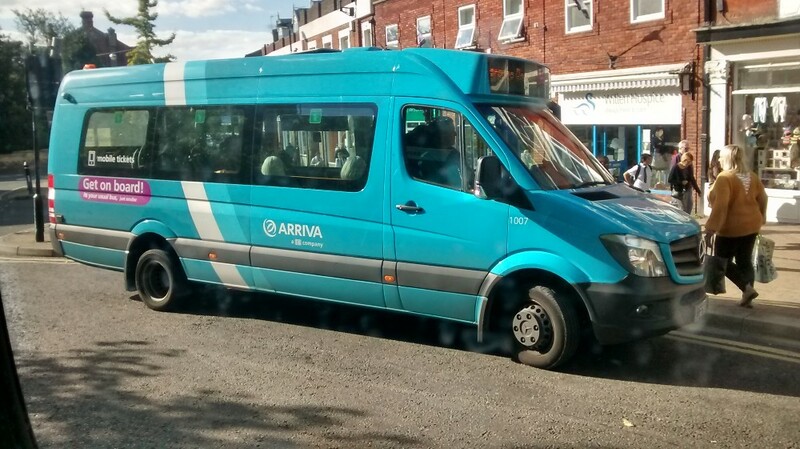 Nick writes "Arriva's 15 seater Sherpa Sprinter fleet no 1007 in use on Leighton Buzzards local service on September 28th 2018. These vehicles limited capacity may be an issue on market days, the DART normally used perhaps having more sensible capacity." 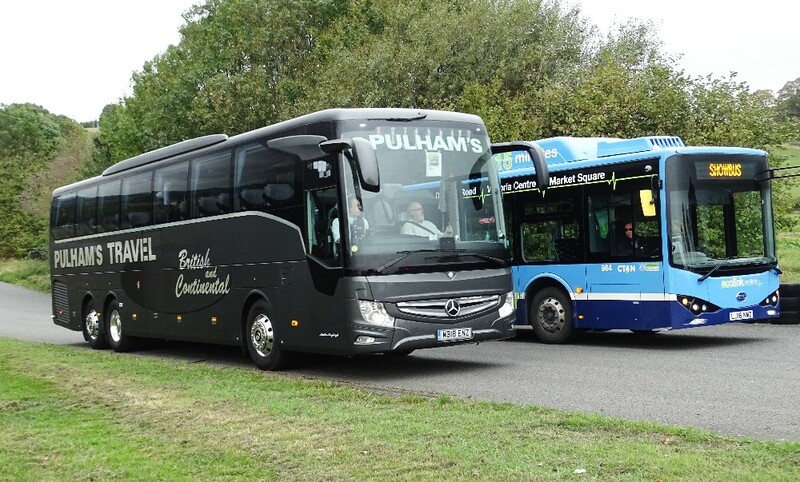 Gavin Francis caught up with two unusual performers on the X74 on October 5th as shown below. This route has certainly enjoyed variety over the past few months! 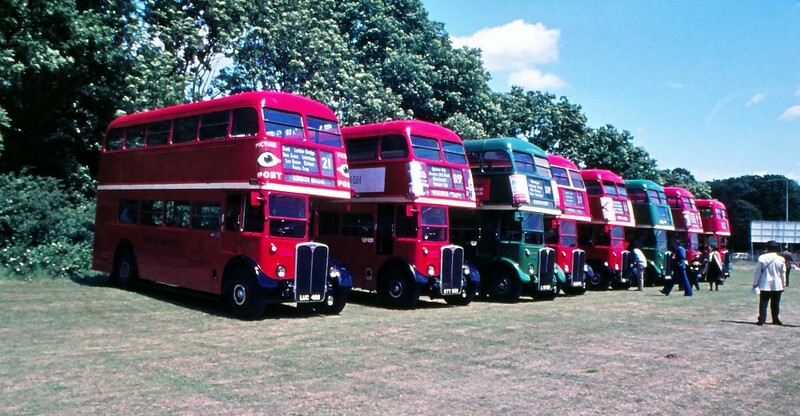 Carl Berry provided an interesting picture of buses on loan to First Bristol. 32234 LR52BNB one of 10 Plaxton Presidents on loan in Bristol on September 18th. Carl comments "32234 LR52BNB. 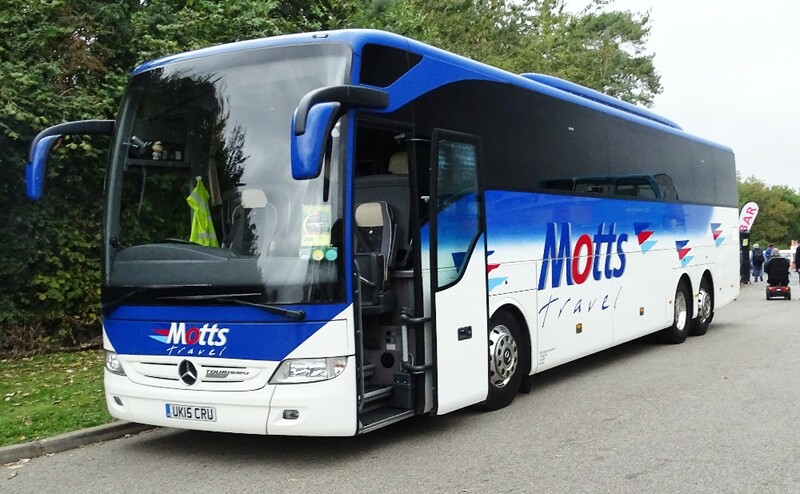 This is one of 10 Plaxton Presidents that First have loaned. 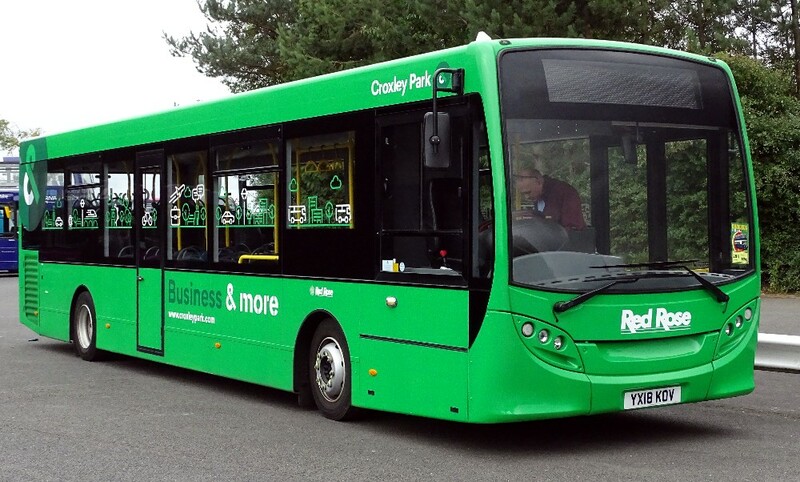 Half have then been loaned on by First to CT Plus so they can operate two local services on First's behalf! 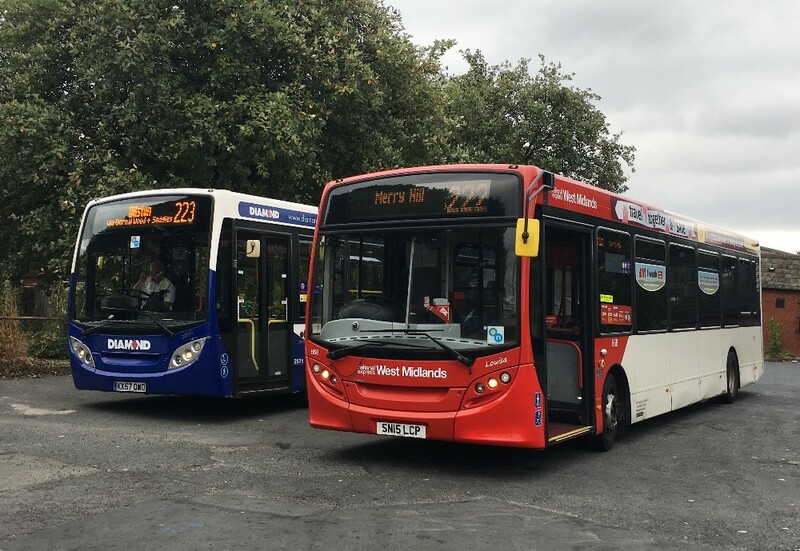 These services will be withdrawn next year when CT Plus start operating a Metrobus service, again on First's behalf but, hopefully, with new gas buses." 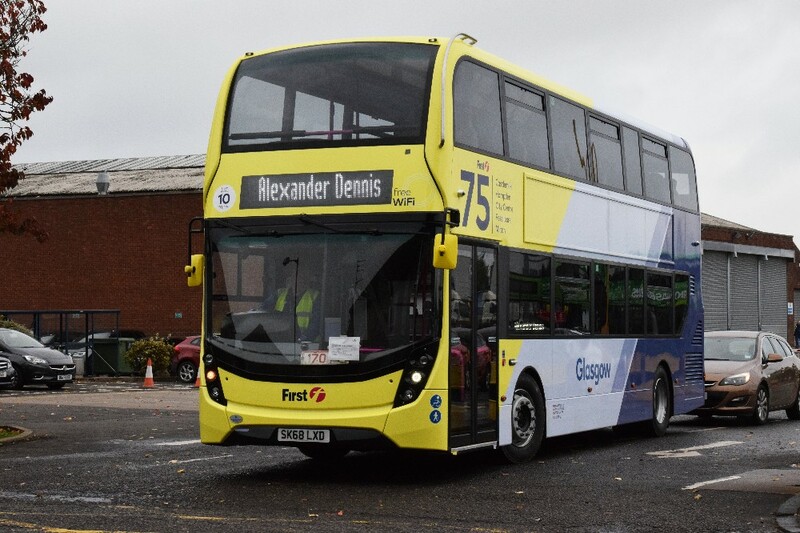 On test from ADL's works in Falkirk we can see the latest buses for Glasgow on route 75. Provided by Gordon Scott. 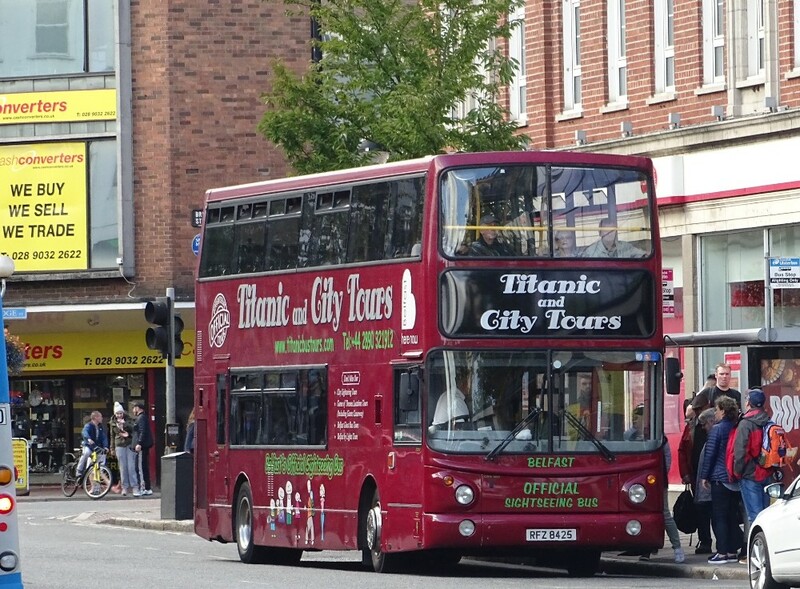 Gavin Francis caught up with a few interesting pictures in High Wycombe on October 5th. 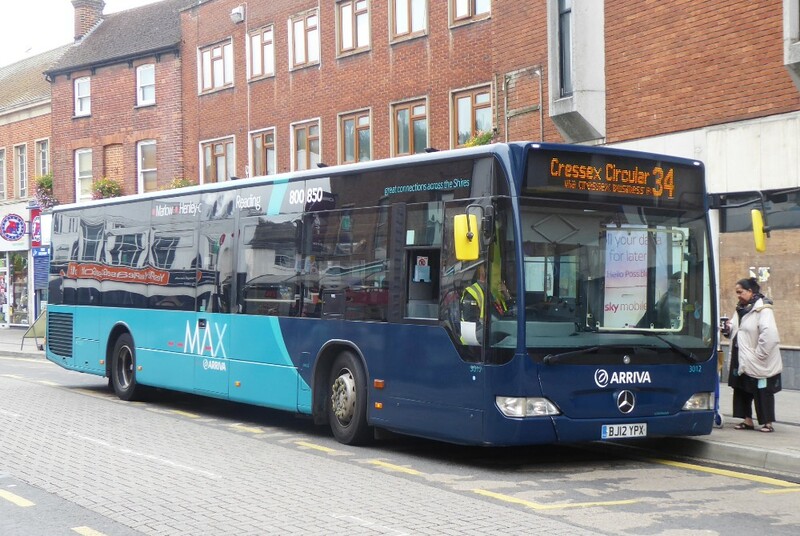 Citaro 856 with a 1A. 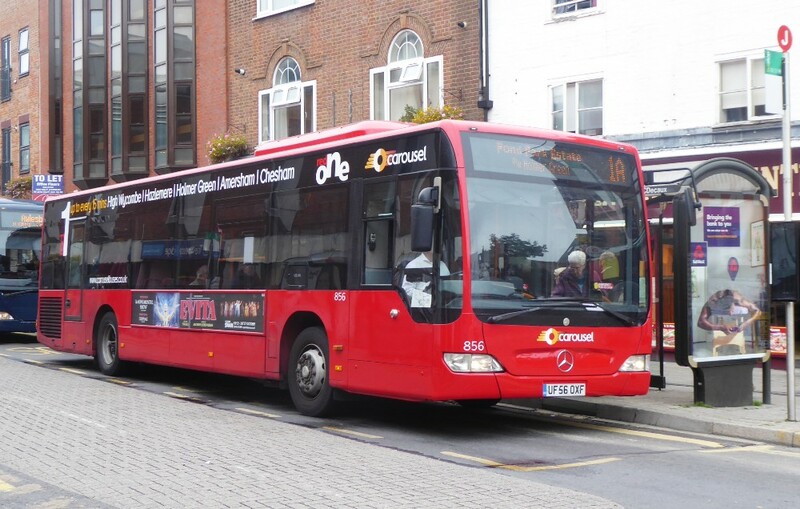 Citaro 858 with a number 1. 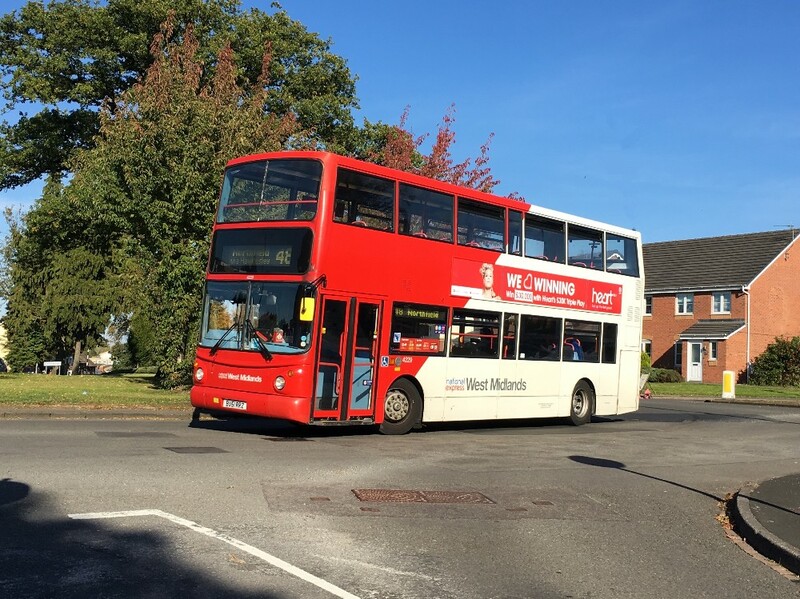 Probably whilst one of the orange ones is off for service, 422 is seen with a 40 working in Stokenchurch on October 3rd by Malcolm Crowe. 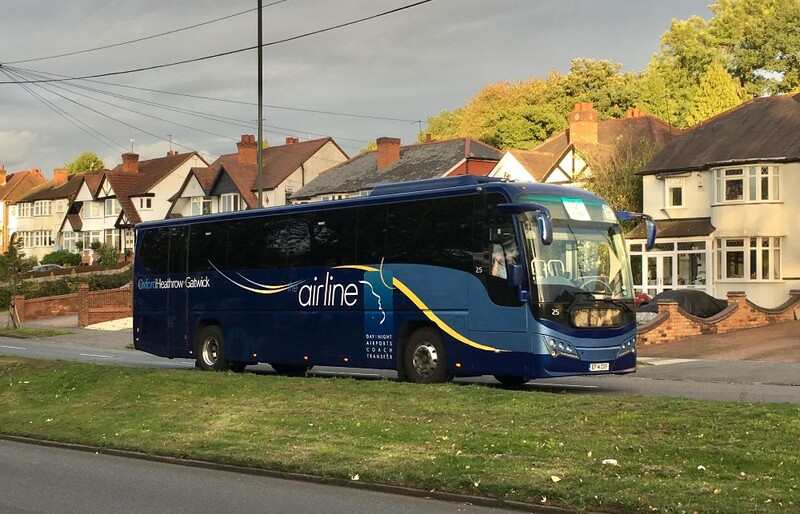 Dylan Jones writes "This evening, whilst awaiting a Contract Service operated by NXWM, which sadly didn’t turn up though I am going off my previous observations, I noted one of the OBC Airline Branded Plaxtons on a Sn-ap service heading to Oxford. 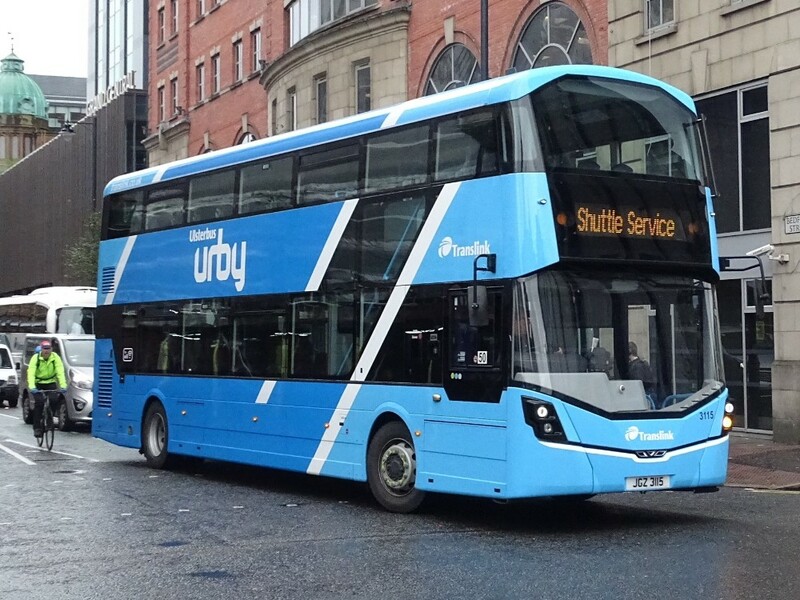 I have seen the dual branded tri-axles on Birmingham bound services previously." Pictured is 25 near the Man on the Moon Pub, West Heath, South Birmingham with evidence of the low sun setting at around 1800. - Road in shadow but trees behind in sun. Seen on October 1st 2018. 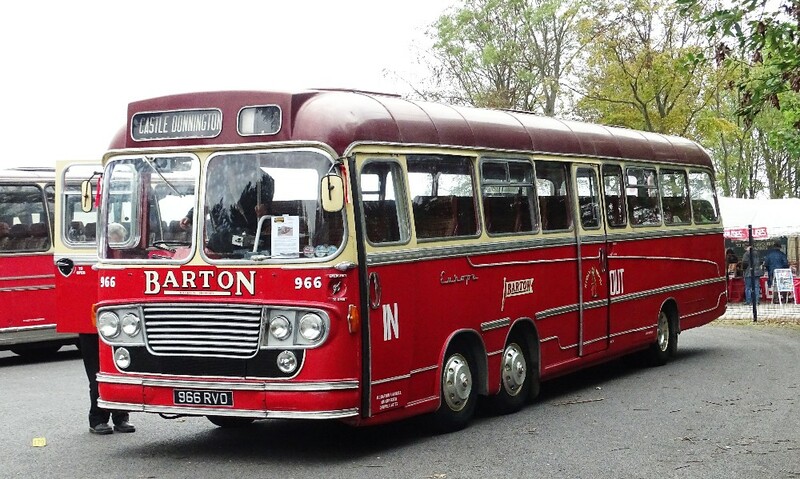 601 with a 2 road service in St Giles on October 3rd by Gavin Francis. It seems that 602 is still all grey. 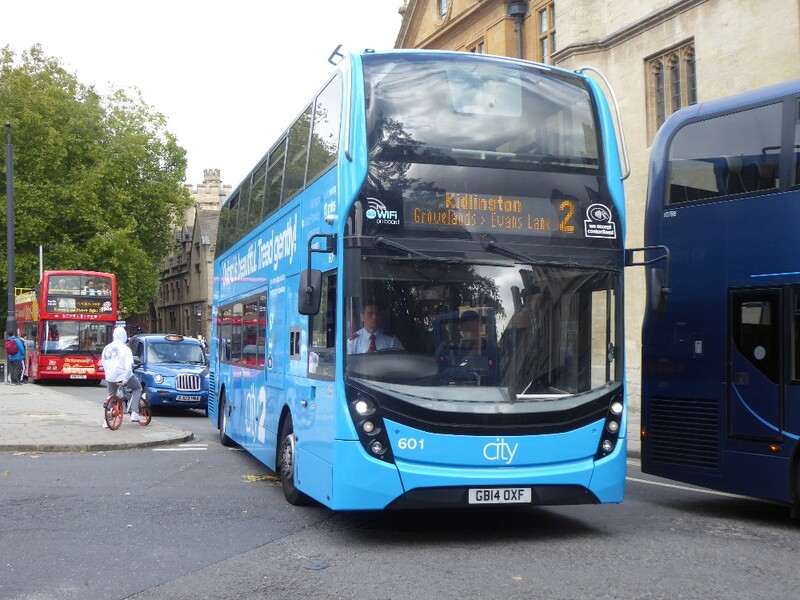 Today, October 7th has seen a Half Marathon in Oxford and Gavin Francis caught up with a few of the extras being run by Oxford Bus. 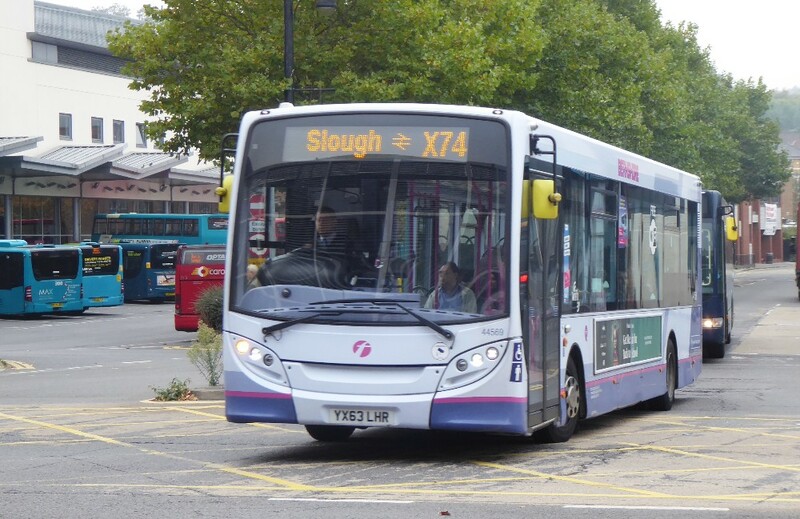 Route 350 has run from Redbridge and route 450 from Thornhill. 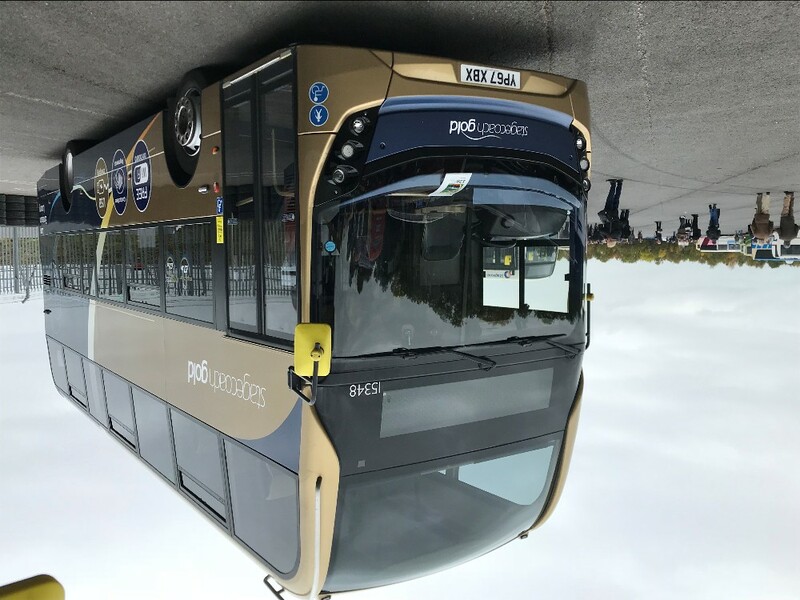 Hybrids 317 and 359 serving Thornhill Park & Ride during the Oxford Half Marathon on October 7th 2018. 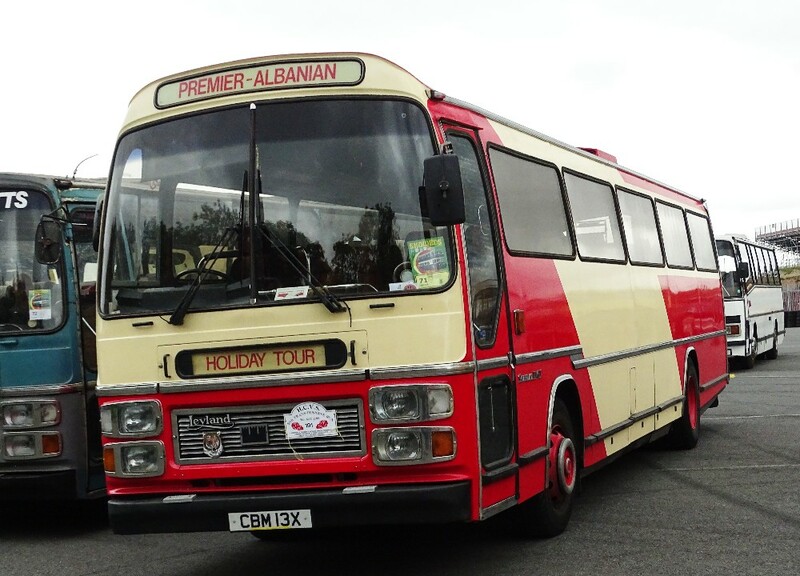 "Oxfords 201 Scania which is nearly completed, this has included conversion to open topper, upgrade of seating and into Sightseeing moquette and removal of the flywheel drive system, so it's now back to a normal diesel driveline, some testing to left to do." 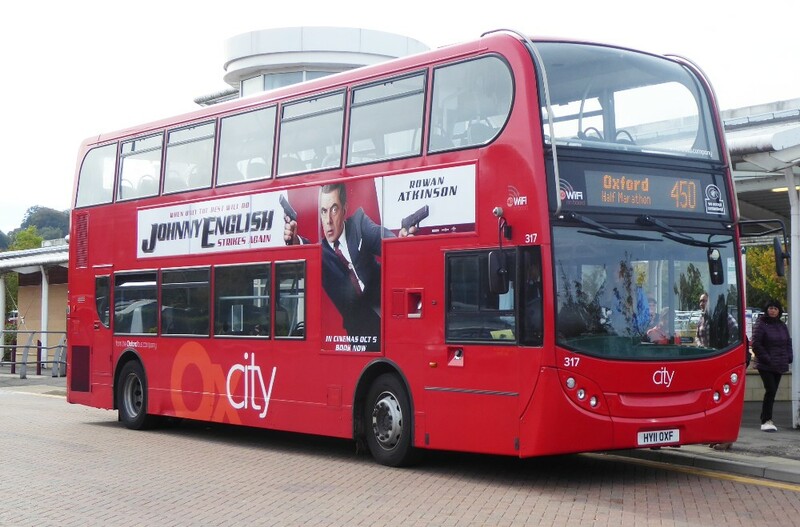 A new service today U1X Thornhill – Frideswide Square. 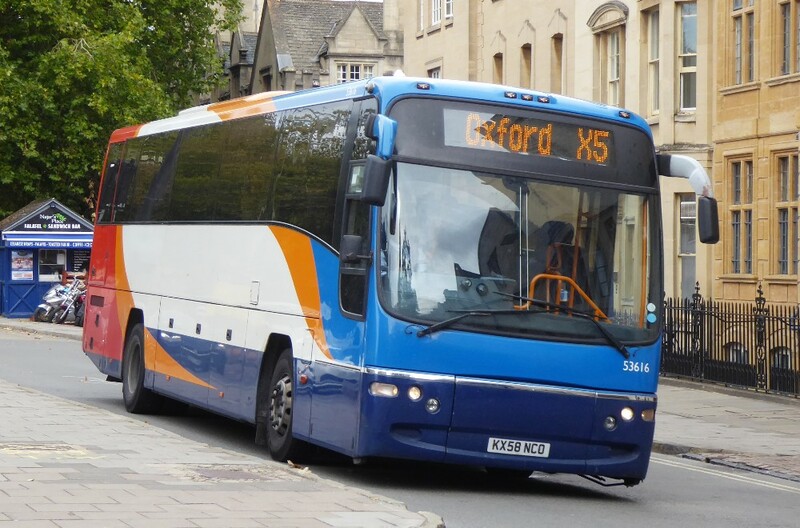 Presumably for a special at Brookes as the website noted that the X was no longer valid as buses could not be express through Oxford. The note was that all the buses I saw on the service were the new ones, 371-376 (I did not stay around for a full cycle as it was too cold). The red 603-608 appear to spend most of their time on U5, not often on U1 (from my observations). Some details of the service changes next month. 41 comes off a Didcot school service as it finishes 1 hour earlier on Fridays due to school early finish. 94. First 2 and last 2 services withdrawn due to poor usage. 136 One trip runs 10 minutes early to meet the needs of a primary school – that’s right - get the children used to buses at an early age. 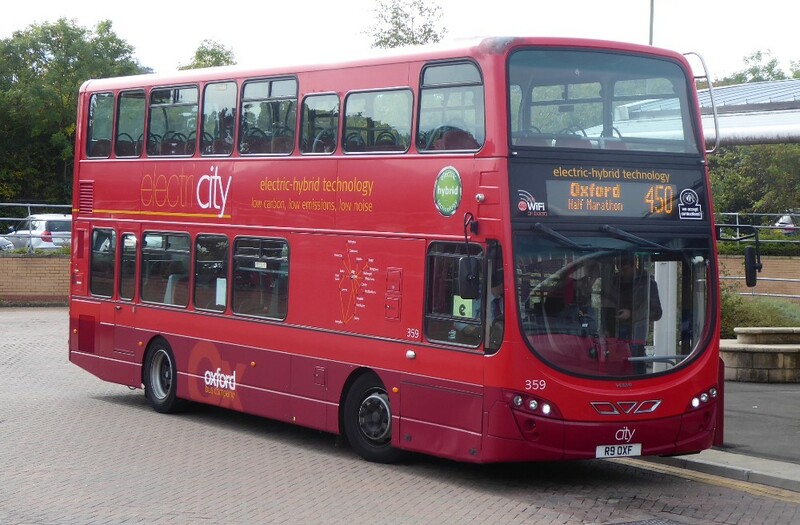 T1 – With developer funding from new housing at Chalgrove, an additional bus arrives in Oxford at about 8:45. Very good as there is one about 6:50. 7:50 but then not until after 10:00 which has not been good for commuters. 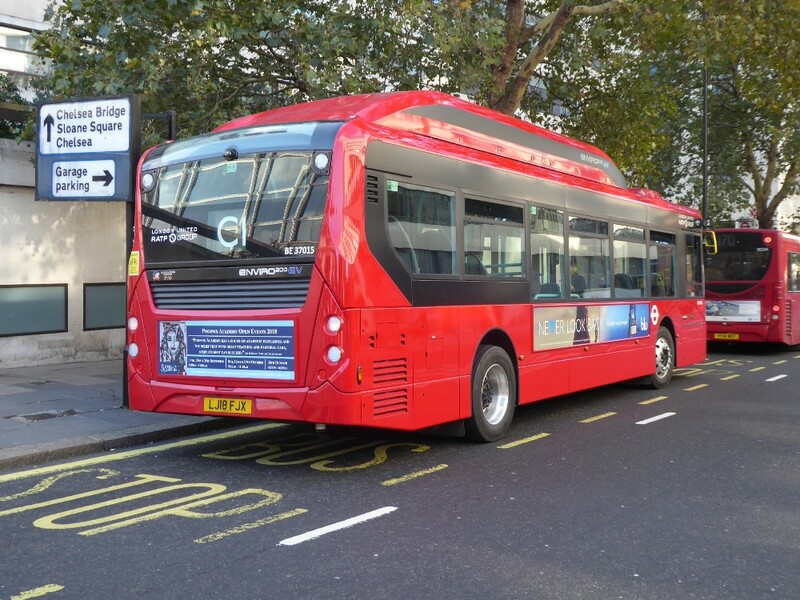 The cost however could be considerable as there is no bus not in service at that time – except the open top buses which used to operate schools (2055 & 2056) when with Tappins coaches. 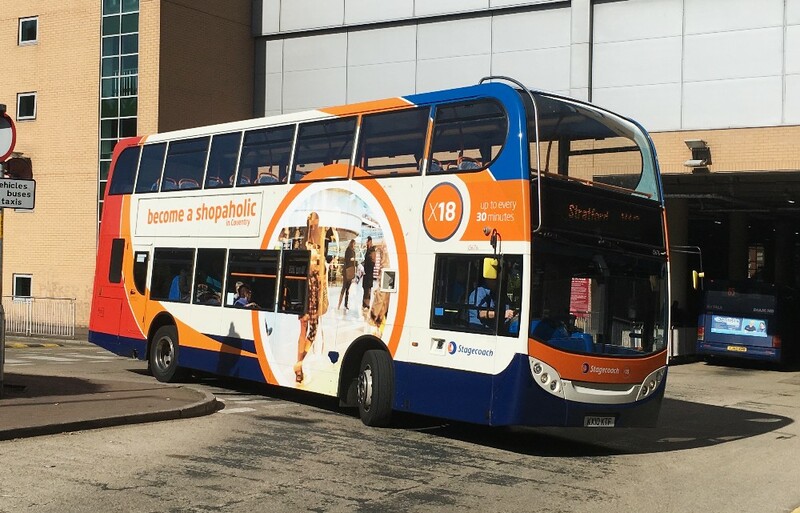 Stagecoach use Tubes on regular service, so why not open tops – the loadings would only require downstairs to be available. 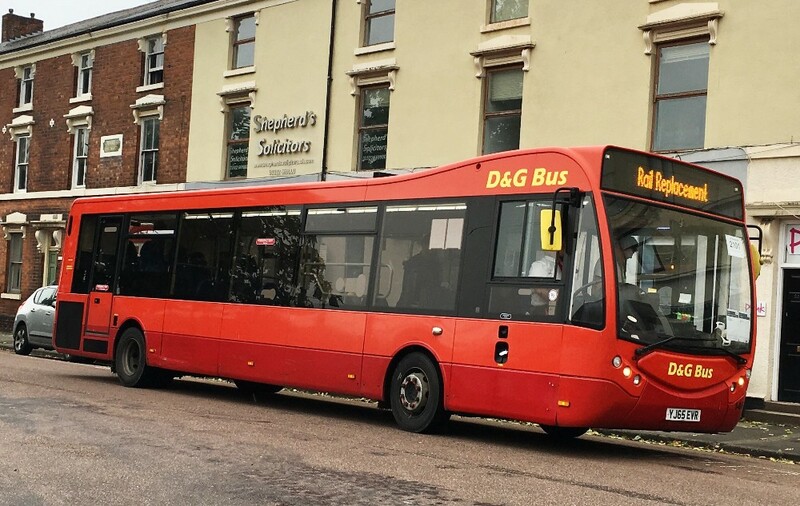 Also more buses will extend from Chalgrove to Watlington. This could be a challenge on timings as the morning services only reach Chalgrove and return with no layover, then the layover in Oxford is probably insufficient to allow extension in service to Watlington. 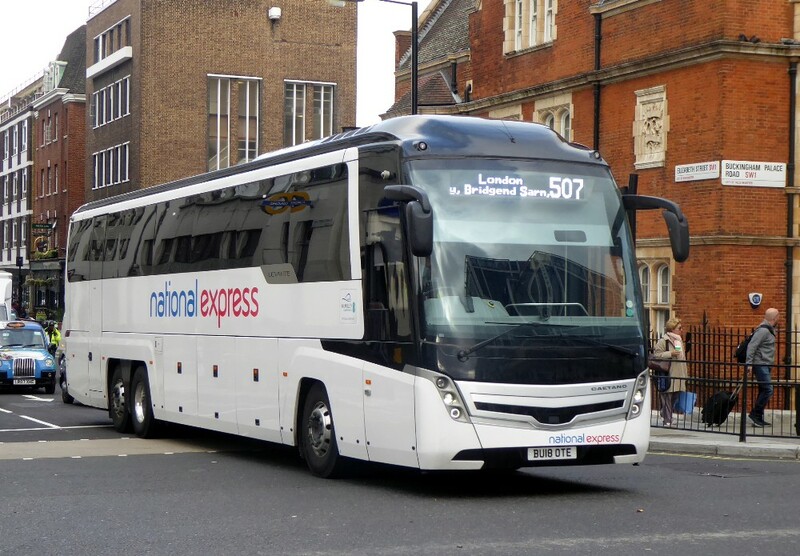 One of the latest Caetano coaches for National Express leaves London Victoria Coach Station on October 3rd by Gavin Francis. 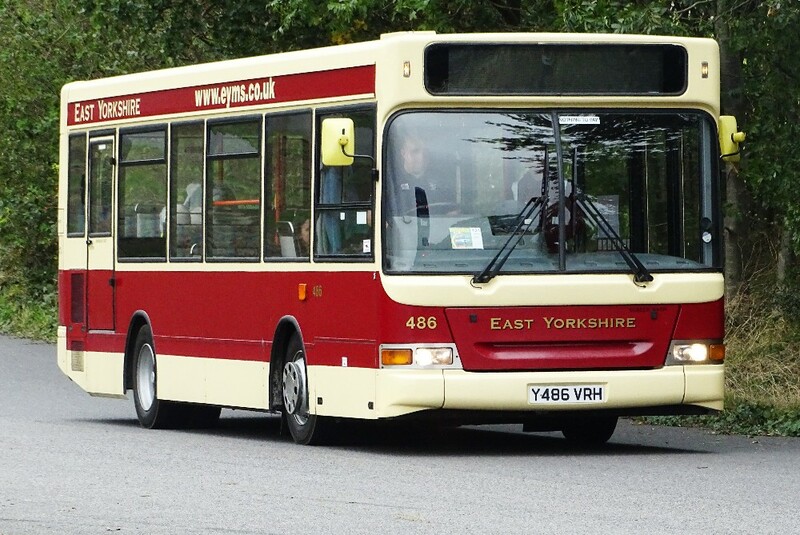 "I just thought that I would write regarding the picture of Reading Buses 1104 that you published on your last page. Please accept my apologies if you have already been contacted by people much better informed than myself! 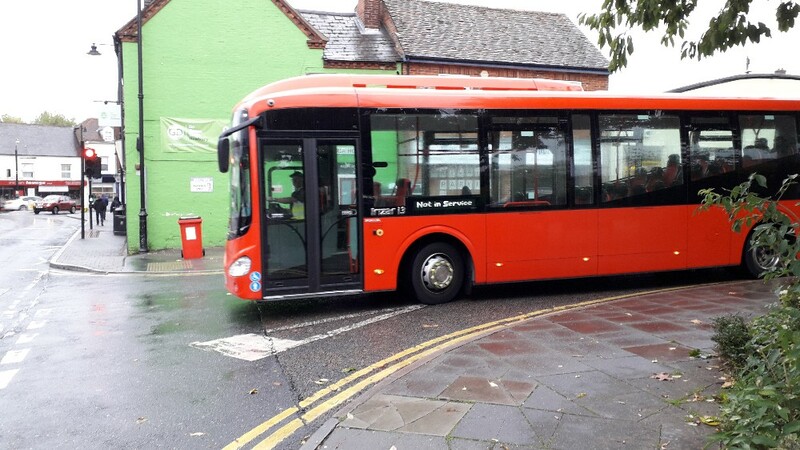 I believe that this bus is normally based in Newbury and wears this all over red livery for use as a spare vehicle for the Vodafone contract services. I am afraid that I could not say what it was doing in Reading, although I have seen it on a few occasions running on the Jet Black 1 service between the two towns. Many thanks for all the time and effort you put into producing the page, it is something that I really do enjoy reading." Thanks Richard, your comments are much appreciated. Ed. 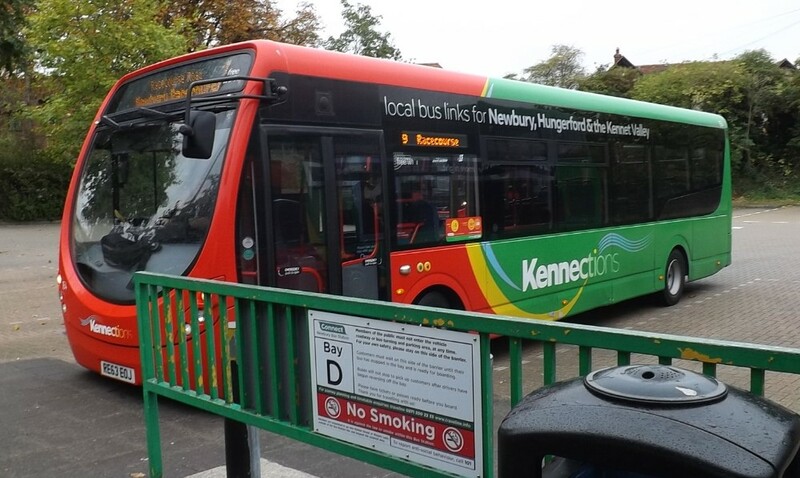 The Current Bus station, located close to the Kennet Shopping Centre and the Newbury Train Station, and is served by all the public buses and coaches in the area. 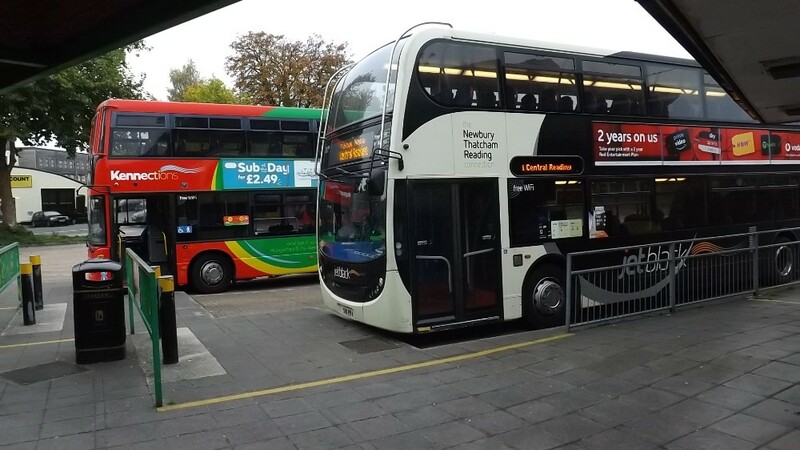 alongside 1105 (Reading Buses – Kennections) on Layover, This bus did not show a destination and had been sitting there for nearly an hour. The present bus station exterior. 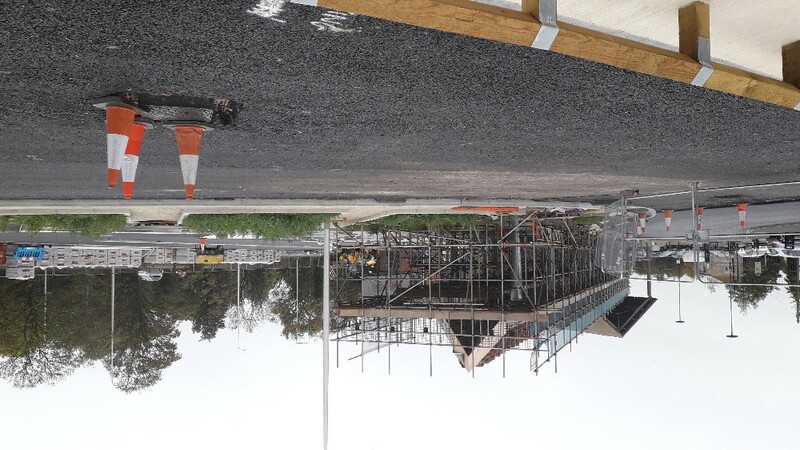 The New Bus Station, Located in the Wharf, Under construction. 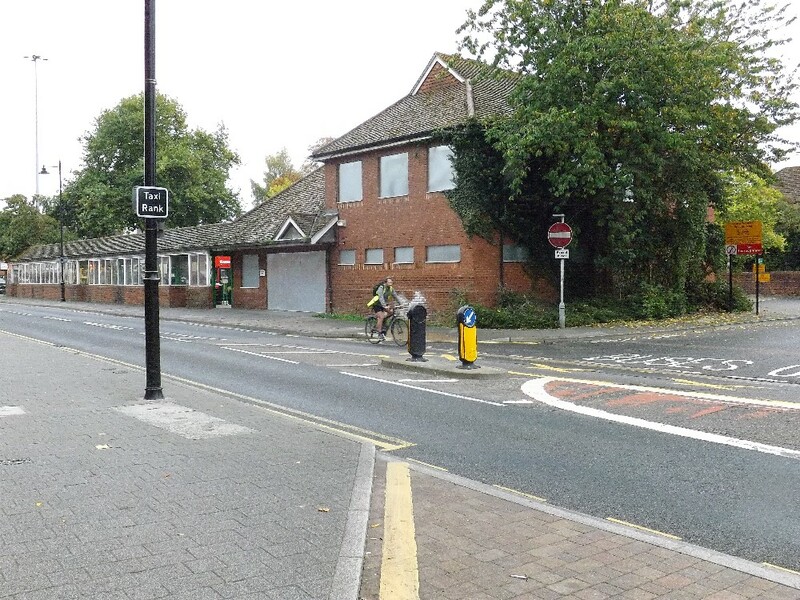 Now what is really interesting is that after many years the bus station is retuning to its original location! Ed. 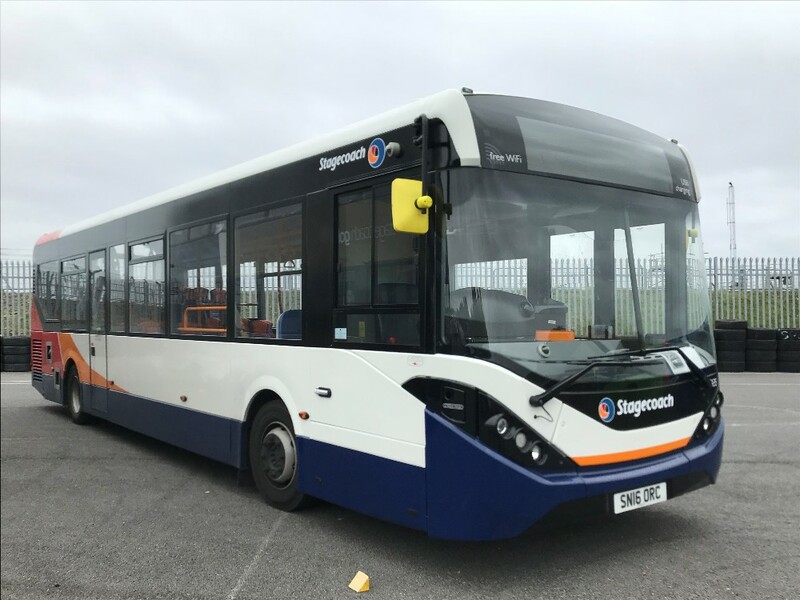 As you are probably aware, Wessex bus (Bristol) has ceased operating with contracted services going to Stagecoach and commercial services being withdrawn. So that required a visit to Bicester today especially after an email from Roland, and it was COLD. The same Solo was on the Bicester Village Shuttle, 20916. Both the legal writing and blue disc were for Wessex. Company transfers show it moving from Avonmouth to Stanwell. 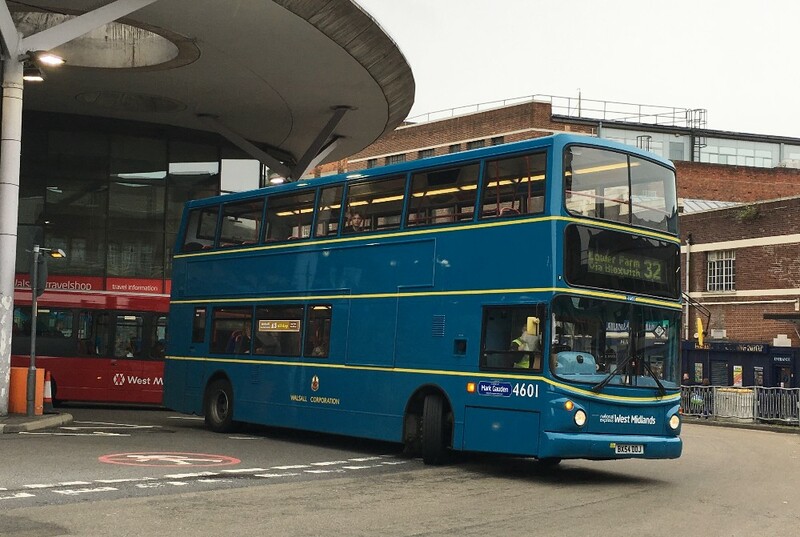 I spoke to the driver who said it was now Hallmark (Rotala at Heathrow) for servicing as Wessex had now ceased. Today there were 3 deckers, all up from Heathrow, all with Hallmark legals. 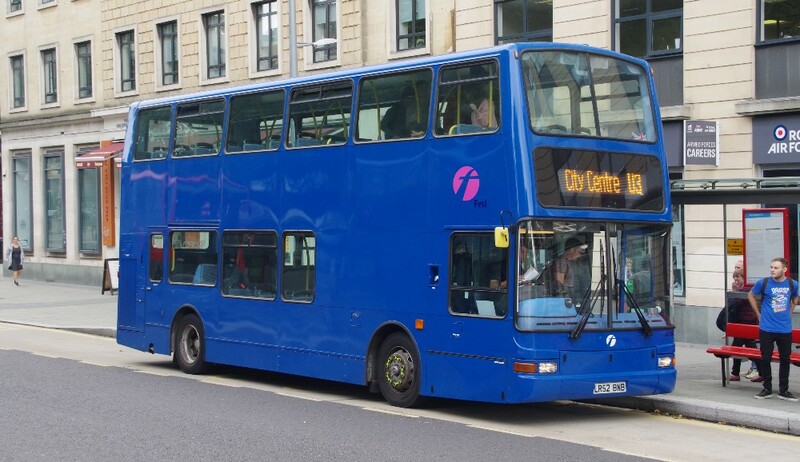 40625 BU14 KTC complete with route advertising 51 at Bristol. The registration would be good for KingsTon College. 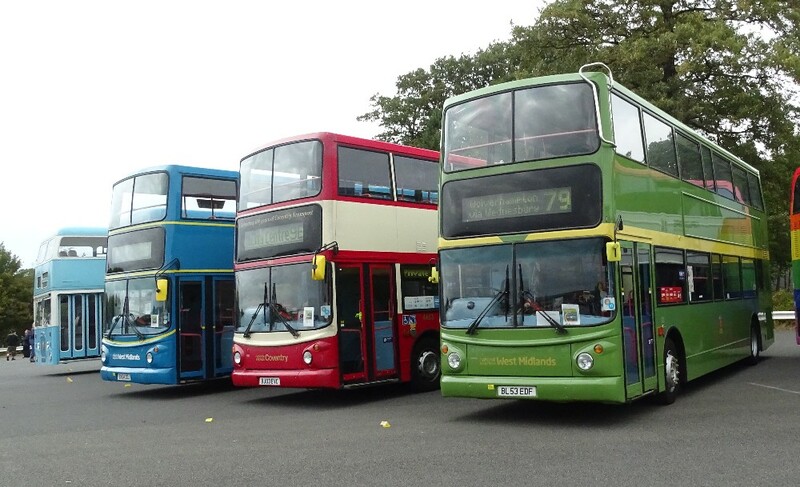 These 3 buses with others are used on Kingston College, DHL and schools contracts. East's 53616 with the X5 in St Giles on October 2nd by Gavin Francis. Midlands 11127 with an X4 working on October 5th prior to branding being applied. 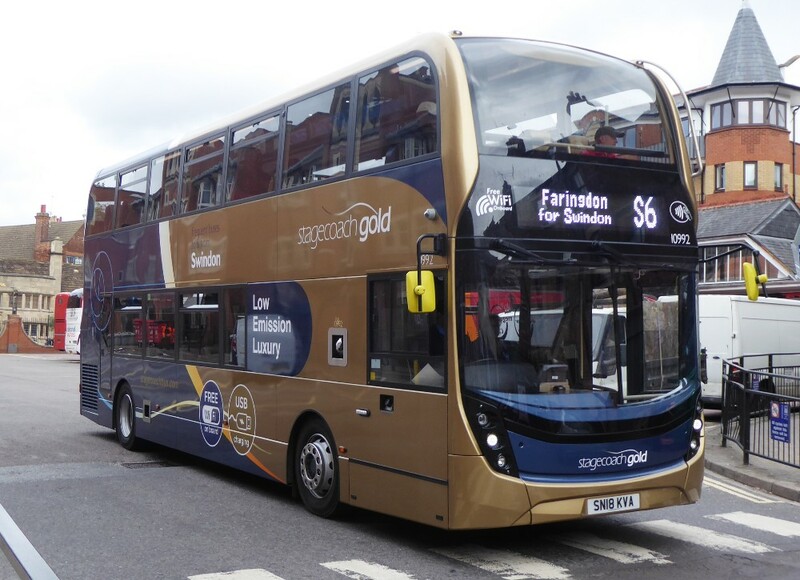 The current fleet of Golds on the X4 is being cascaded to Merseyside. This is the fleet being delivered at this time. West's S6 branded 10983 leaves Gloucester Green for Swindon on October 3rd by Gavin Francis. Unbranded 10992 also heading for Swindon on October 2nd by Gavin Francis. Gary Seamarks reports that nine of the 09 plate Van Hools are with Procters Northallerton for resale at £82,000 each - the logos are stripped in image on Facebook. 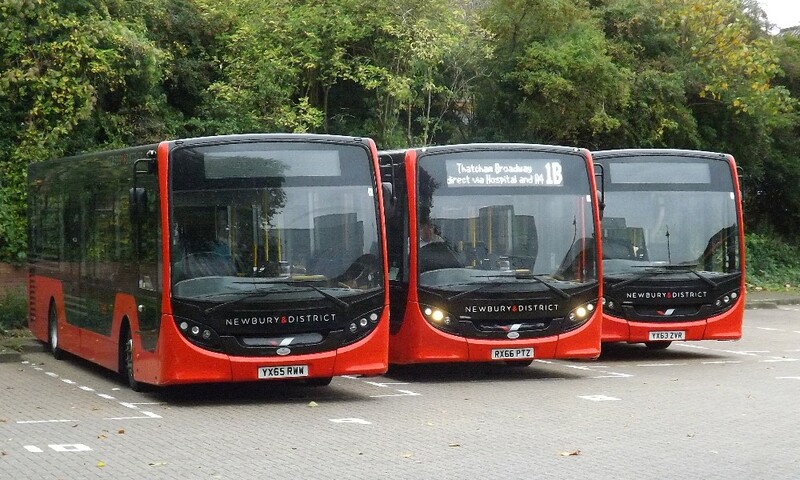 Ralph Adams kindly provided a fleet list for Weavaway following the sale of Newbury and district plus other parts of the operation. 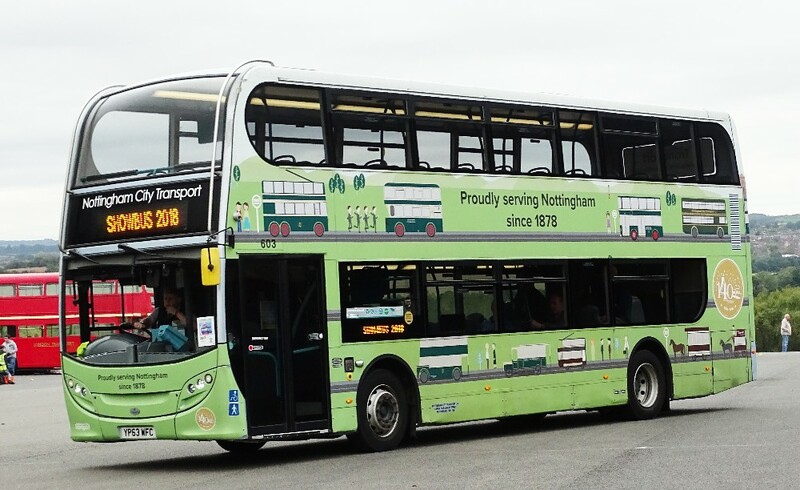 Abellio LT638 overall wrap for Diesel working route 211 on October 2nd by Gavin Francis. 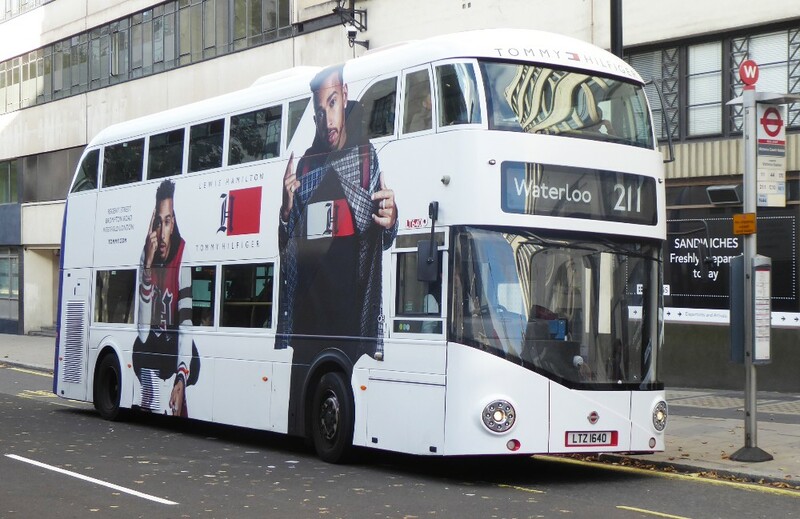 Abellio LT640 overall wrap for Tommy Hilfiger working route 211 on October 3rd by Gavin Francis. 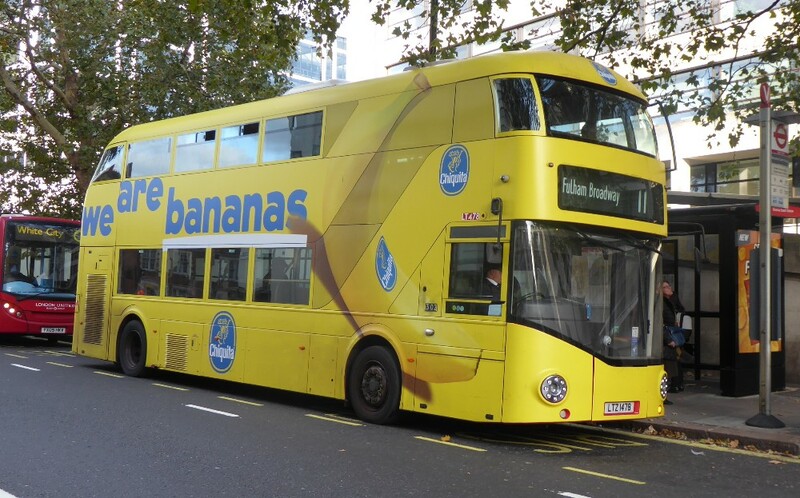 Go Ahead LT478 overall wrap for Bananas working route 11 on October 2nd by Gavin Francis. 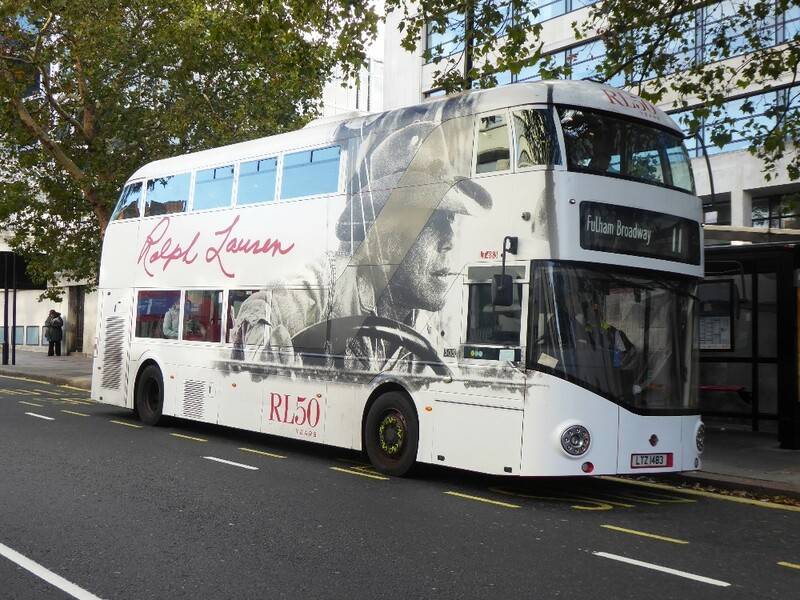 Go ahead LT483 overall wrap for Ralph Lauren working route 11 on October 3rd by Gavin Francis. LUL RATP BE37015 LJ18FJX with the C1 on October 3rd by Gavin Francis. 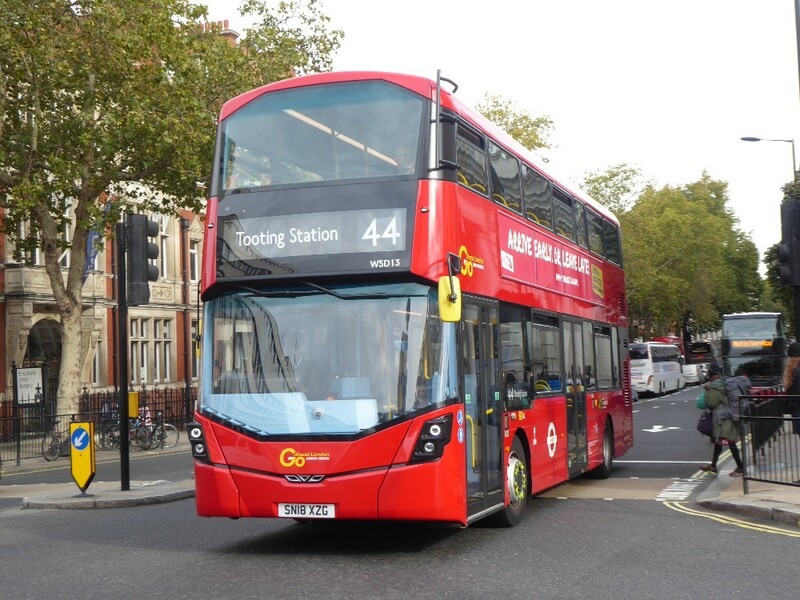 Route 44 has at last seen some newer buses, WSD13 is seen on Buckingham Palace Road by Gavin Francis, the date is October 2nd. 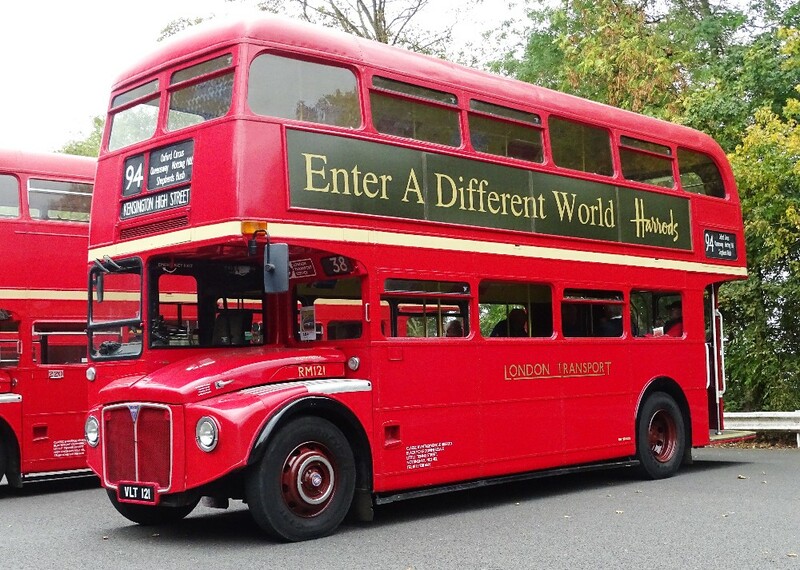 The Original Tour has some new buses and seen above is PO68CAX a Unvi Open top on crew training by Gavin Francis, the date is October 3rd. As an amusing end piece to this issue!! Apologies if anyone is offended.